Many performers enjoy simply doing the same act year after year, but to maintain interest with not just your bookers but yourself, Jasper has always strived to continually offer different things, and these past few months have been no exception. So from intimate dining rooms to suprise parties in hotels in Gloucester, from repeat graduation ball bookings in Llandovery to entertaining the FIFA staff at the Champions League Final at City Hall, this is only part of the story. Two new acts (one reimagined after almost 10 years in mothballs), plus taking his one man Kockov show to London for a 5 day sell out run in an intimate venue near The Old Vic, only to return the following month with his play The Vienna Experiment also enjoying sell out shows too, add to that having to replace Jeremy Clarkson for a charity auction in Chipping Norton - playing another new character, ex Bargain Hunt presenter Binkie De Sluice, and to top it off another sell out Kockov show at Bristol's Smoke and Mirrors theatre followed the next day by a magic lecture. So far November kicked off well with two days of magic performance in Cardiff's O2 flagship store for the iphone X launch - who knows what December holds? Life never appears to be dull as can be seen by the variety of different events Jasper has been a part of over the last nine months. 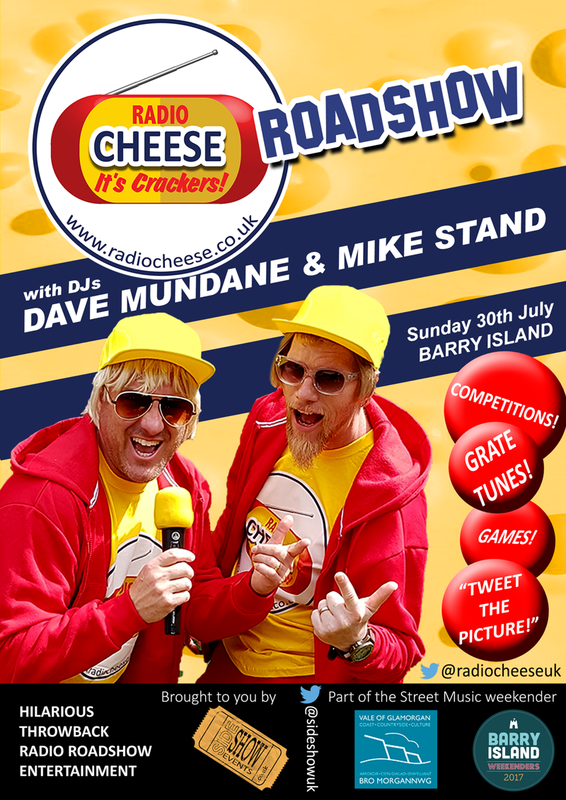 From appearing at a leading mentalist festival as Kockov, numerous appearances on regional television and national radio as a news/entertainment pundit, appearances on BBC drama Casualty, Newlyn Fish Festival as his tv comic chef Jamie Olivoil, several corporate charity events as host and performer, magic lectures from Darlington to North Wales, helping to launch one of his new products at Blackpool Magic Convention, stand-up in Oxford, parties in Sheffield, Christmas parties from Huddersfield to Hertfordshire, various Christmas Fanshaw bookings in Surrey Quays and closer to home, The Postal Express residency for The Welsh Rugby Union at The Principality Stadium for the Rugby Internationals, also appearing several times in Cheltenham for the festive season, a Great Gatsby gig and yet another bespoke character ‘Chip’, an appearance at The London Horror Festival with his new play ‘The Vienna Experiment’, a sold out show at Bristol’s Smoke & Mirrors theatre, a Fanshaw’s close-up party for Deloittes in a beautiful central London Victorian venue and another regional appearance as The Mad Hatter pre-Easter. All in all busy busy and the bookings are already coming in for Christmas 2017 ! So much has happened in the first half of 2016. Besides famous names passing, the Euros and Brexit, Jasper has managed to do his usual trick of maintaining an extraordinarily varied calendar of events and happenings. 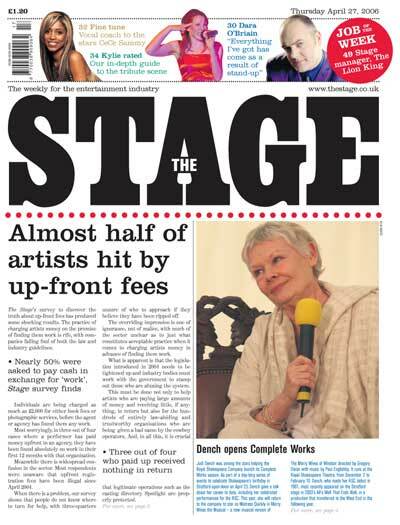 Having been chosen as one of only four acts out of an original short-list of nearly six hundred, SideShow Event's highlight for December was meant to have been a hugely profitable twelve day double-act booking in Dubai. Sadly due to an awful piece of agent mismanagement at the other end, the booking was cancelled at the eleventh hour. But no matter, another fabulous booking was just around the corner. 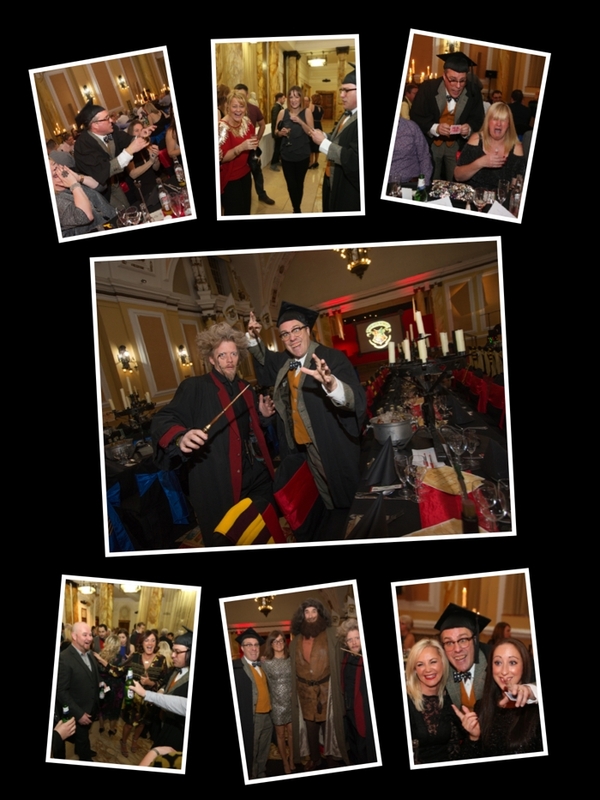 City Hall in Cardiff was transformed into a wizarding school of epic movie magical proportions for a corporate Christmas event for 600. 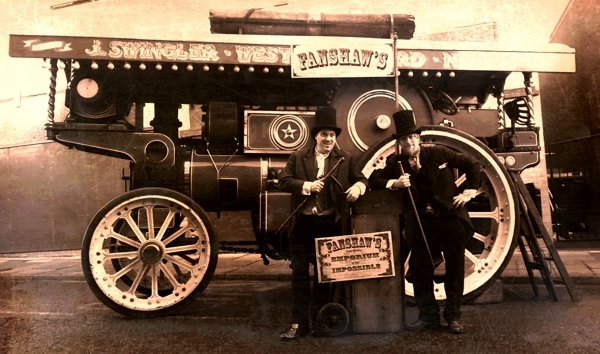 Luckily at very short notice, SideShow Events were able to provide two of the finest character magicians, Jasper Blakeley and Frank E. Haschka. 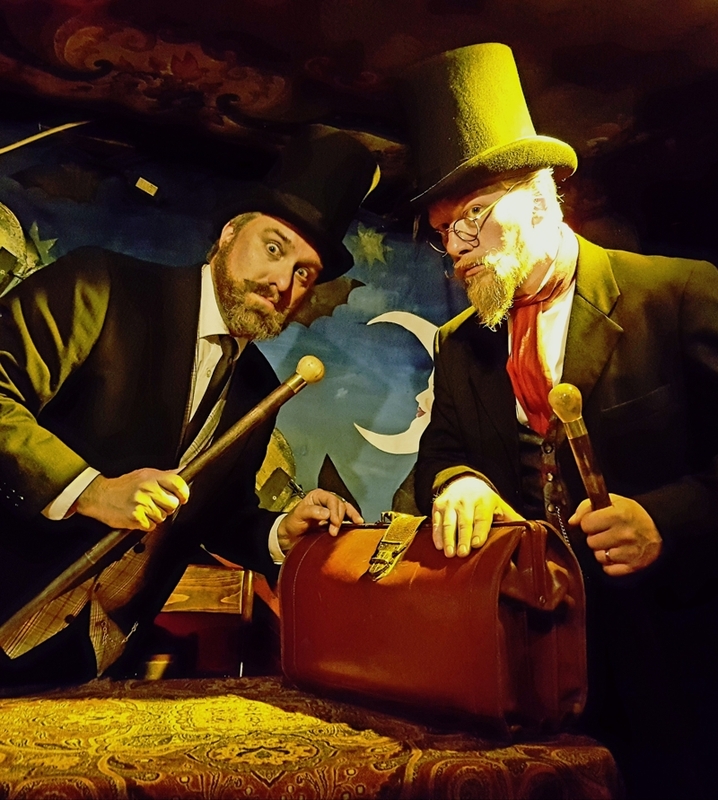 Conjouring up two brand new 'in the style of' characters from a well known book and film franchise (any similarities purely coincidental), guests were treated to the new 'Masters of Muggle Magic', Professors Raucous Phleghm (Frank) and Professor Tacitus Flinch (Jasper). With bespoke carved wands created by Frank for the evening, along with fully realised characters, the reaction of the close-up wizarding magic was fantastic from a very enthusiastic audience. Thanks must go to Steve Pope at Foto Wales for the great photos and the London agent, Contraband, for such a great and unique booking. Jasper is thrilled to still be working for three great children's charities in south Wales, the longest one for about a decade now, but this month it was time to say a proper goodbye to a young teenager who sadly passed away a few months back from cancer. Dylan Gunner was a wonderful lad who loved sport, loved Swansea and really loved magic too. It was through charity Dreams and Wishes that Jasper met Dylan a few years back and after Dylan asked for a wish to get a magic lesson, Jasper was delighted to visit him at his home in Swansea and teach him for a whole afternoon. 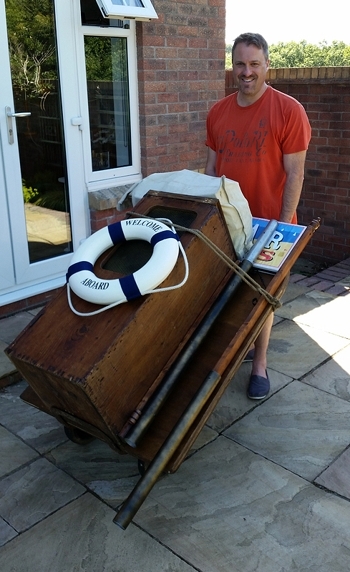 Off the back of that Jasper contacted magicians on social media and after a few weeks Jasper was able to present Dylan with over £500 worth of donated magic tricks, books and dvds from dozens of professional magicians from all over Europe. Sadly Dylan relapsed and ended up in intensive care back in July, eventually losing the most amazing and brave fight against a merciless disease. Goodnight Shining Star was an evening of celebration and charity fundraising in Dylan's memory held at The Manor Park Country House in Swansea this month, and Jasper was honoured to give his time to entertain the guests, which included regional TV and radio presenters alongside local sportsmen like The Ospreys (pictured being entertained by Jasper). After the annual black-tie close-up magic excitement of 'The Fast Growth 50 Awards' booking that Jasper makes for himself and his three magical colleagues (this year Phil Jay, Dorian and Frank E. Haschka), this month also saw Jasper's long awaited publication of a commissioned article about mentalism and performance in the very secretive and esoteric volume Psycrecy. 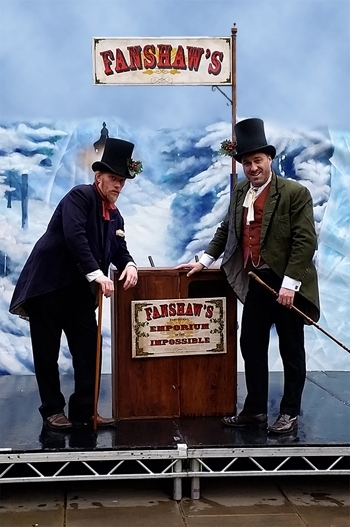 After that things started to fill up with SideShow Events back on the road with Fanshaw's entertaining some of the 50K people attending the Kingston Upon Thames Christmas light switch on. Fanshaw's were booked through a new agent for this event and it proved great as they were given their own stage, p.a., backdrop, lighting and security (swanky). 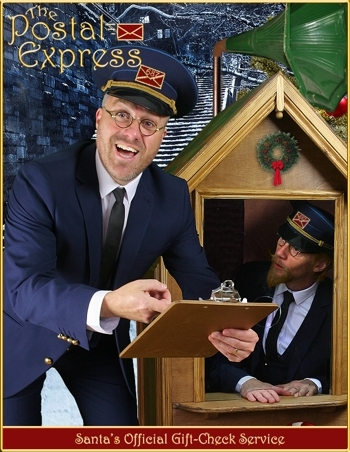 After this SideShow Events (Jasper's other entertainment company that looks after his 6 double acts with performance partner Frank E. Haschka), the boys created a bespoke twist on their new 'Postal Express' act (pictured) and tweaked it to be 'The Railway Express' (pictured blowing a whistle and standing by the adjusted train ticket booth) for a large corporate client's dinner at a vast venue in Windsor. 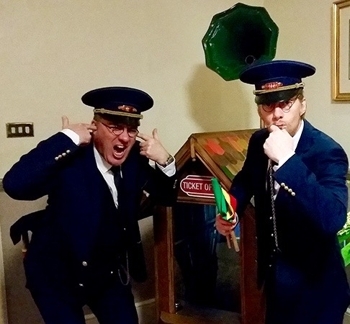 The engineering client were thrilled at the railway themed magical double act, especially the way in which Station Masters Stamp and Punch waved their flags, blue their whistles and hurded the four hundred and forty guests into dinner. During dinner, the Station Masters went around the tables in character and performer close-up magic, warning of the scams and hustles passengers should watch out for on the railways of Britain. Fanshaw's was out and about in Bridgewater for plastics company Ensinger, who were celebrating a milestone anniversary. After several bouts of walkabout close-up magic and chicanery, Archibald Grottlington Esq. 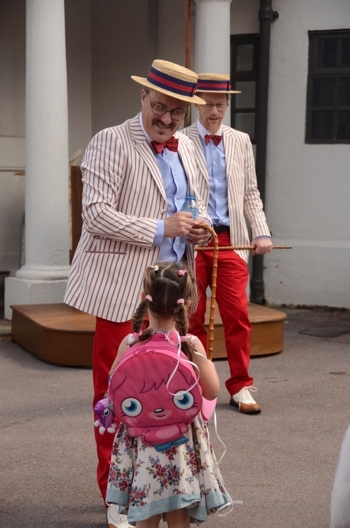 (pictured left) and Herbert Skittle (also Esq) (pictured right) performed two separate cabaret shows, one family-friendly and one more 'adult' in nature. The several hundred guests also enjoyed live bands, multiple fairground rides, games, a hog roast and even a cider bar. Many thanks for Momentum Photography for the super snaps and to Darren Tipples of Wild West Entertainments for the booking, the client was thrilled with the entertainment. It's been a busy few months for Jasper, whether it was a 50th birthday event at a local 5 star hotel as Kockov, entertaining with close-up magic and compereing for another year at the Catherdral School fundraising Ball at The National Museum in Cardiff, working for several days as an actor on BBC's Casualty, a corporate event for several hundred doctors at a regional golf complex, working as Kockov at an amazingly lavish wedding in the sunshine-soaked Devon countryside or (as pictured above) working three different thirty minute conjuring shows as The Deckchair Dandies, it's been great fun all round. Jasper knows he's very lucky to have double-act partner, Frank E. Haschka, who can build anything. So it was this summer that Jasper finally twisted Frank's arm to convert a Victorian box into a multi-channel wireless p.a. system complete with a fully collapsible stage. 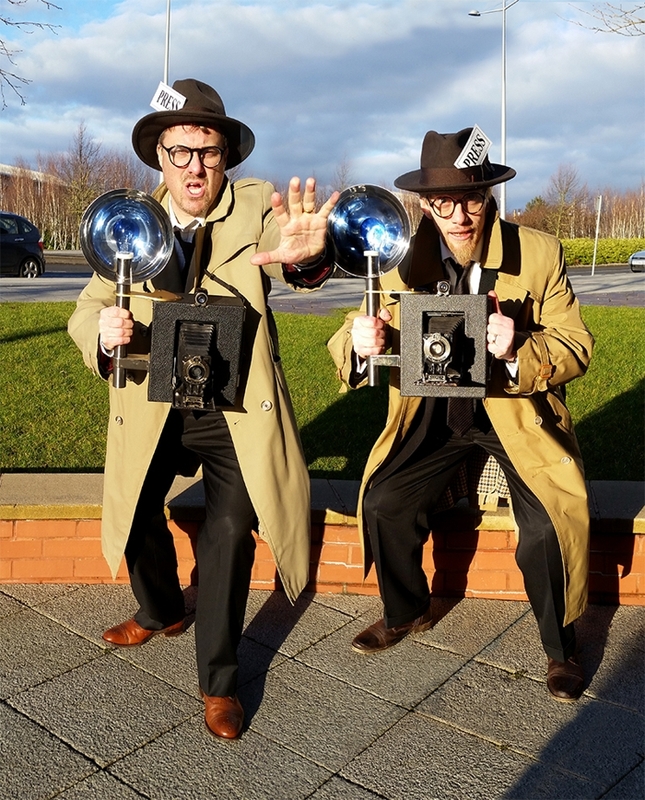 The pair are delighted by the outcome with the whole staging fully customisable to the many varied character double acts they currently offer for hire. 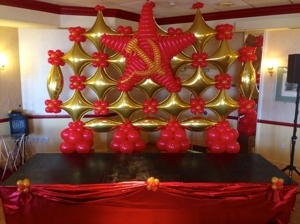 See www.sideshowevents.co.uk if you'd like to add the impact of a professionally themed stage and p.a. to one of the available double acts. 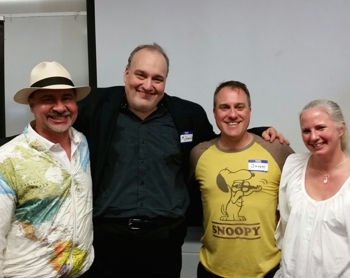 For the second year in a row, Jasper was asked to lecture at the prestigious Change Phenomena Conference in London. 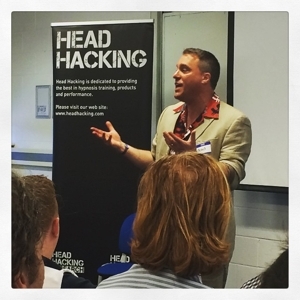 Change (as it's known) is one of the most well respected and cutting-edge conferences dealing with all aspects of hypnosis - most notably 'hypnotherapy'. Having been a self-hypnotist for more than twenty years, and more recently as an entertainment hypnotist, Jasper has combined his character magic with the art of hypnosis. Last year's conference (scroll down to see the full story) saw Jasper as Kockov doing a lecture on cold war military hypnosis, but this year he was asked to lecture as his covert American motivational speaker - Brad Stooges. As a character Brad is always used to fool corporations, conferences or seminars, and at Change, he got 'em good. As a Tony Robbins style motivational speaker Brad (Jasper) fuses his magic and mentalism skills with that of an outrageously over-the-top inspiring guru. As he weaves his unbelievable heart-wrenching life story into soundbites of total drivel 'Power Talking' ''The Art of Envisionalisation', he hopes to see the penny slowly drop in the eyes and minds of the audience - but the majority rarely rumble him. Jasper added a further layer of deception to his act by self-hypnotising himself to make himself believe he was actually his own creation - bizarre but true and it works. If you're interested in finding out more about this extraordinarily 'different' and funny act for your work's away-day or strategy days, just get in touch using the details on this website. Jasper is always delighted when clients book Brad to work his outrageous mischief on unsuspecting workforces. Gosh it's only Charlotte Church getting cosy with the boys ! 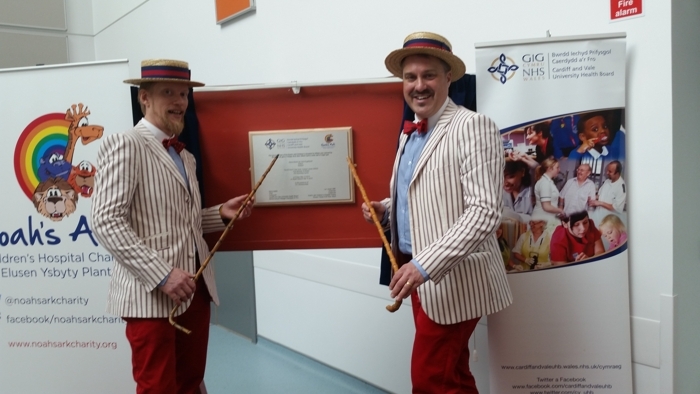 The Deckchair Dandies were thrilled to be asked to attend the opening of the magnificent second phase of the Noah’s Ark Children’s Hospital for Wales. 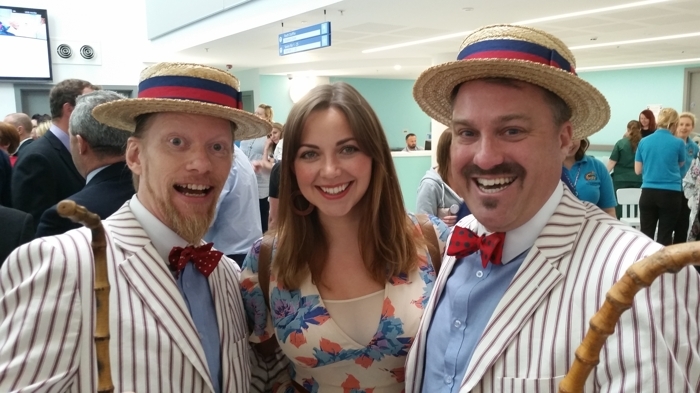 With a throng of VIP guests, staff and patients gathering for the grand opening, The Deckchair Dandies entertained their way around the impressive new facility to the delight of the crowd. The level of support for this new phase in care for children in Wales is exceptional and we hope will continue ad infinitum. 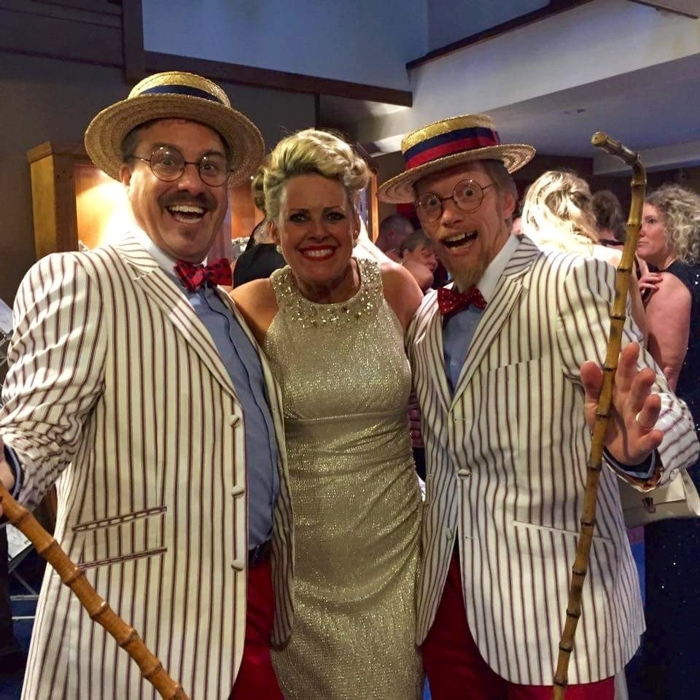 It was the fourth year that Jasper has appeared at The Reach May Ball, and this time he brought his Sideshow Events partner, Frank E. Haschka along for the ride too. 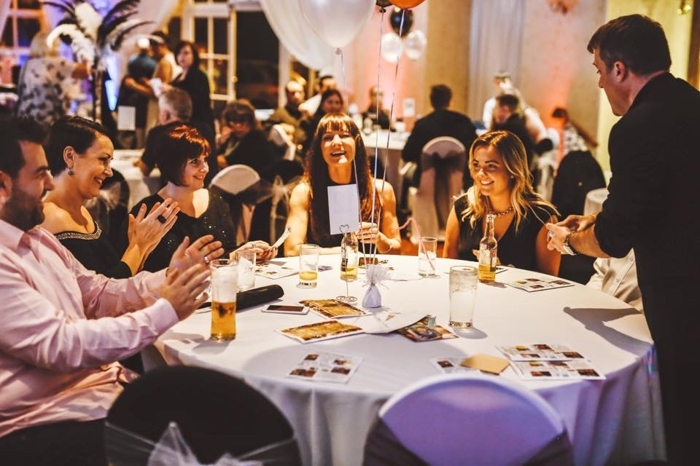 Reach is the UK's leading children's charity providing support and information to those affected by upper limb difference, and every May, Sian Brooks (pictured) organises a ball to raise money for the charity. 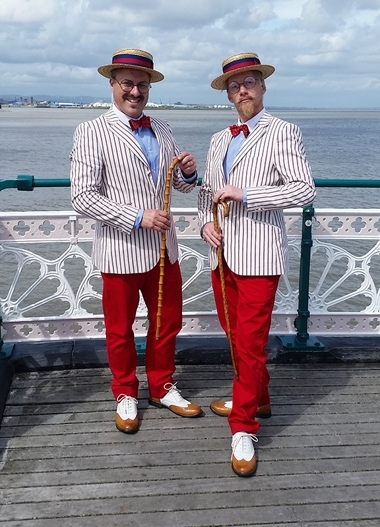 This year the theme was the seaside/beach, so Sideshow Events created a bespoke typically posh English promenade double act - 'The Deckchair Dandies'. On the left is Jasper as Barnaby Bucket (pronounced Bouquet) and on the left is Frank as Simeon Spade (pronounced Spa-day). These cheeky trickster toffs mixed and mingled amongst the two hundred strong guests during the arrival drinks, worked around the tables with their close-up magic during the dinner, performed a bespoke 30 minute beach magic themed show, complete with a song and dance, mind-reading and even real sandcastles. They rounded off the evening with more close-up magic in the bar. Sian Brooks commented "you were amazing as always" - good to know, plus a large amount of money was raised by the generous guests for a fantastic charity. The Mad Hatter was out and about again this month, and the event even bore his name. 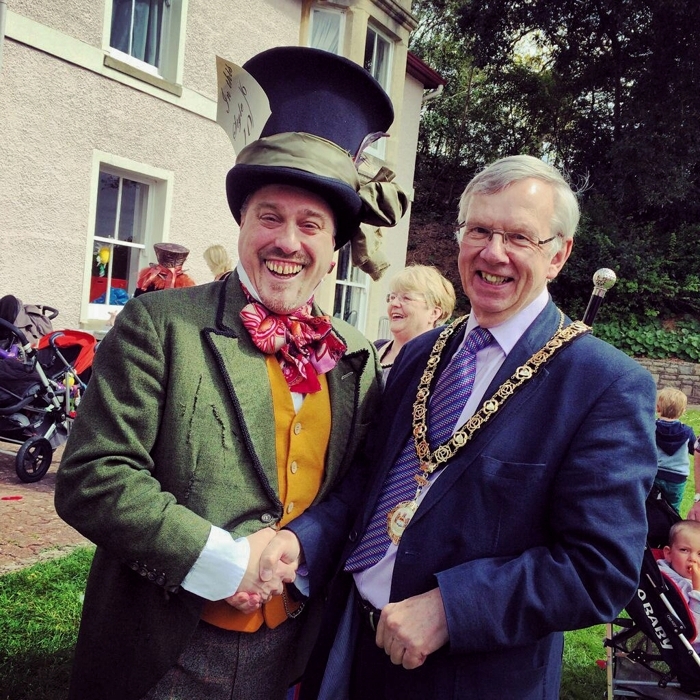 The “Mad Hatter’s Family Day” – a special event organised in support of the Mayor of Penarth's adopted charities - drew family crowds who enjoyed crafts, games and activties in the glorious sunshine. 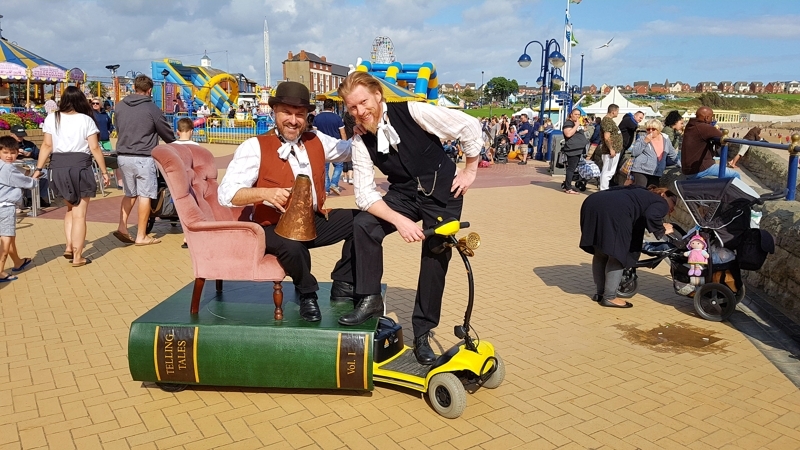 The event was organised by Ceri Lambert of the Penarth-based firm Ceri Lambert Designs, and was designed and developed as a themed day of fun for all the family – inspired by the Lewis Carroll’s “Alice in Wonderland”. The Hatter didn't quite persuade the Mayor to send his necklace off to Cash 4 Gold, but he left him the envelope in case he changed his mind. There was no twiddling of thumbs these past couple of months as Jasper travelled North to lecture for The Huddesrfield Circle of Magicians, South to do headline a stand-up event at Exeter Golf Club (photo), down to Verwood to lecture and then star in the gala show at The Wessex Magical Association's one day convention (photo), entertain a young corporate crowd at Ryder Cup venue, The Celtic Manor, host a regional events organiser's amazing 50th birthday party (complete with Elvis tribute act) and finally to London for a private party in a beautiful house with Kockov. Jasper was delighted to help launch his new gambling card effect, 'Deal of Misfortune', at the world's largest magic convention in Blackpool this month. 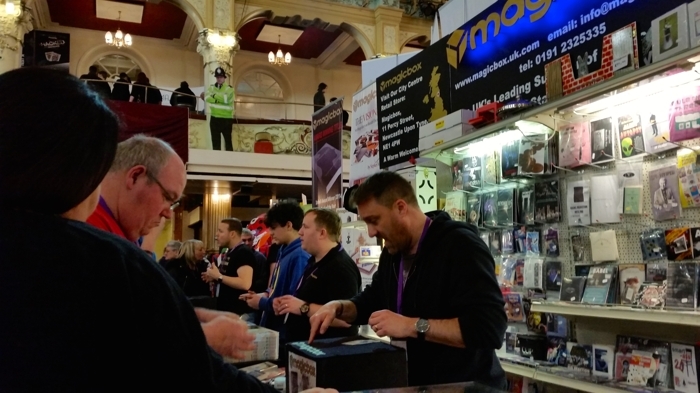 Every year more than three thousand magicians from dozens of countries around the world descend upon the seaside resort to watch shows, lectures and buy effects and props from over 150 world-wide dealers. Strictly for magicians only, this extraordinary event is the highlight for many conjourors as it's the only time you get to see some great friends and performers. Jasper has released several popular mind-reading effects and DVDs over the years, but this is the first time he's brought a commercial close-up effect to market. Many thanks to all the team at MagicBox who bought the rights to produce the effect, especially Michael Murray, who ensured Jasper's name was attached to a truly quality product. You can buy the effect direct from MagicBox or Jasper has a limited supply available at any of the lectures he's giving to societies and clubs around the UK in 2015. 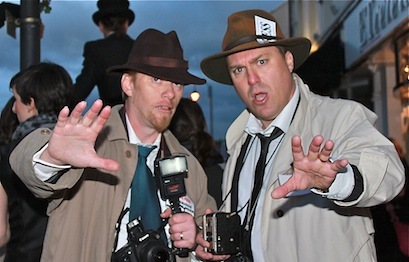 SideShow Events were working hard again this month, this time as comedy press photographers, Len Scapp and Cameron Flasch (pictured). 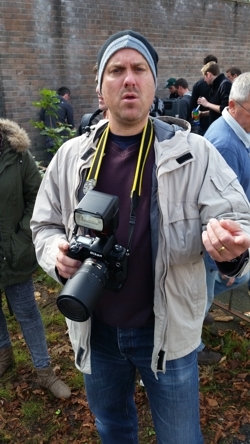 Brought in my Adam George at InHouse Entertainments, Len and Ron 'Snaparazzi', were the 'entertainment' factor for Kate and Wills Royal Look-A-Likes. Arriving in a beautiful Rolls Royce and flanked by security guards, Kate and Wills greeted men and women, posing for photographs and shaking childrens' hands. It was hard to count the number of double-takes, and mix that in with the constant hilarious banter of the two Fleet Street photo-hacks, and it added loads of fun to a Valentines day in Mermaid Quay. Look out for more acts from SideShow Events again in Cardiff Bay later this year. 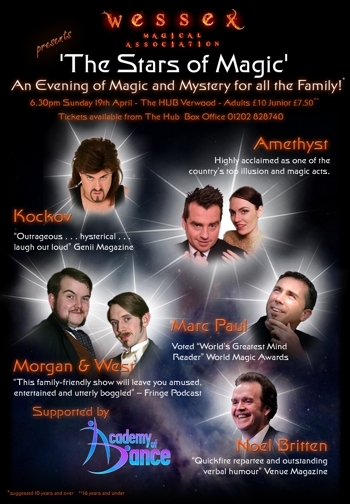 Kockov was back at the fantastic Bristol magic and comedy venue, Smoke and Mirrors this month, for another one-man show. Featuring several new effects, this Valentines event proved popular again for the secoind year running - look out at this venue for new characters accompanying Kockov twice again later this year. 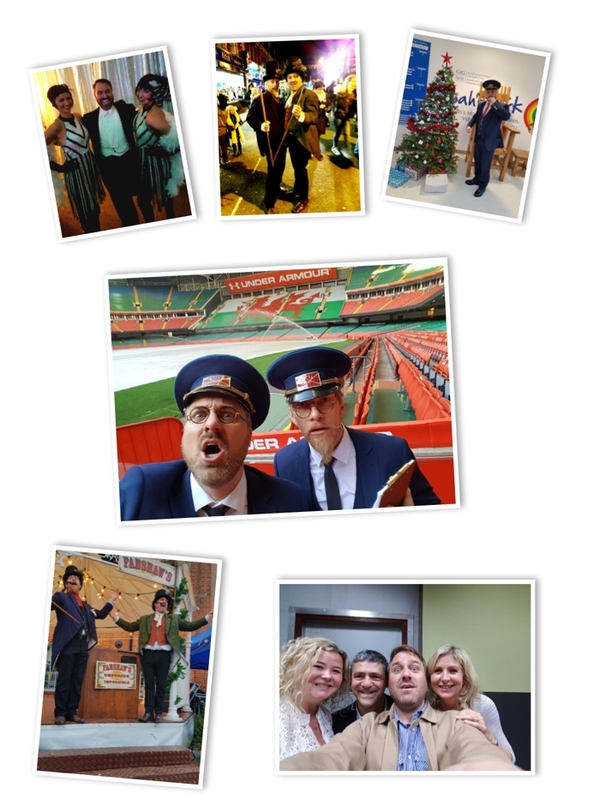 The new year started, as it has done for the past half dozen years, with several large family corporate events for Admiral Insurance in both Cardiff and Swansea. 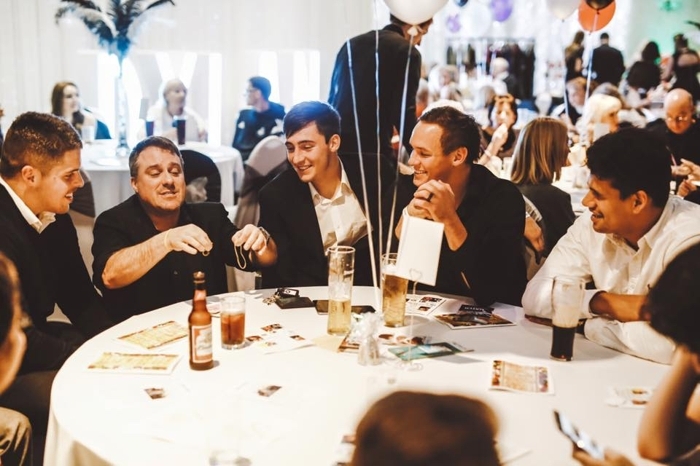 After a break last year, The Sincliar Group booked close-up and cabaret magic for their annual awards evening at the Vale Hotel, this was followed the next week by a fantastically fun evening of walkabout magic for Kockov at a suprise 50th Birthday Party. But it was the act that Jasper's sister-company - www.sideshowevents.co.uk - created that was the most involved and rewarding. Co-owned by Jasper's fellow performer, Frank E. Haschka, SideShow Events specialises in creating bespoke acts to suit any event. 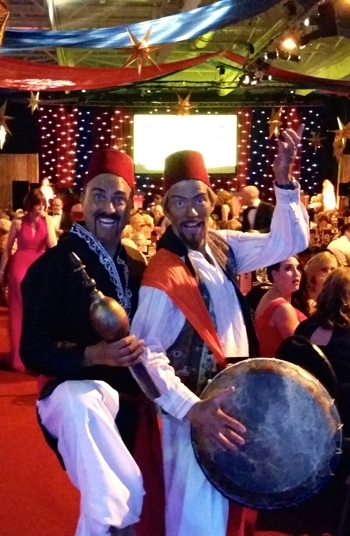 So it was that Paul Williams (of Paul Williams Events) asked SideShow Events to come up with an act to fit their 'Rock The Casbah' corporate awards dinner for The Principality bank. 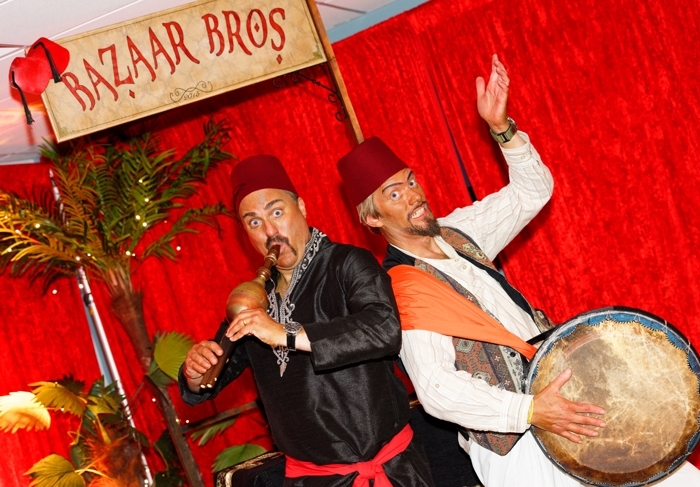 The 600 guests were treated to an amazing Moroccan-themed venue (SWALEC Stadium), complete with themed food and music. The band for the dancing was the UK's best Madness tribute band - One Step Behind, and providing three different 30 minute conjouring cabarets were The Bazaar Brothers. Complete with authentic bespoke costumes, instruments, dances and pre-recorded show elements, both the booker and client were delighted with the result. With a backstory explaining that these 'cockney-accented' sun-tanned rogues were in fact originally conjoined twins from Peckham sold into a North African Circus at the age of 4, it was quicklly apparent that anyone watching (and laughing) would quickly become part of the show - Bazaar Brothers indeed ! 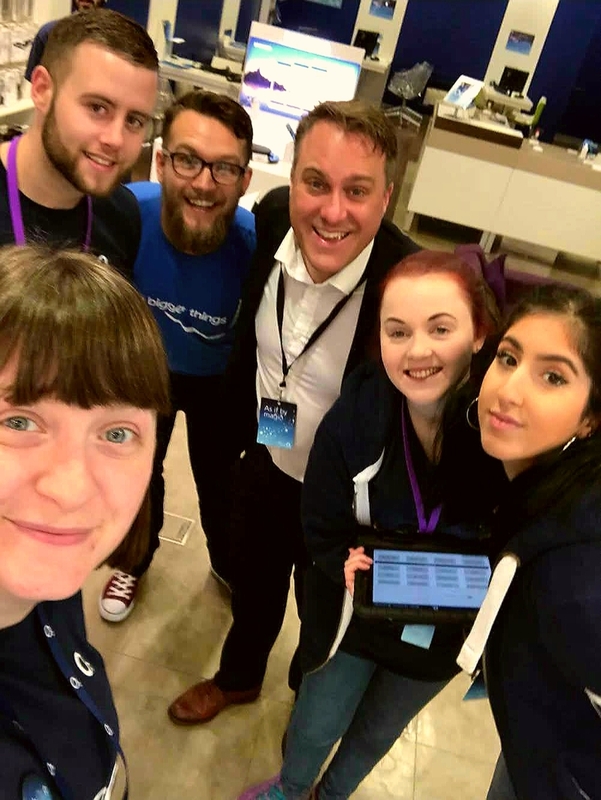 As as trained journalist with over a decade of experience in the UK radio industry, Jasper is often asked to call upon his particular skill set to inspire and encourage university students within the world of media. Having sucessfully run a course of workshops on voice training for TV and Radio in 2013, and following last year's well received lecture on Confidence, Jasper was once again booked to lecture at UWIC's Atrium media centre in Cardiff. Around a hundred students from all years attended Jasper's lecture on 'Asking Questions' - trying to encourage students to have enquiring minds and above all get involved and show enthusiasm for a career - vital in the current jobs market. So far the feedback from students and lecturers has been fantastic. It's always the busiest of months for many entertainers, and this year was no exception. Whether it was Kockov headlining at The Glee comedy club in Cardiff Bay, hosting a bespoke event for a leading UK furniture company in a stunning venue in Picadilly Circus, hosting a corporate family event for The Royal Mint in central Cardiff, performing at an extraordinarily posh private party for one of The Times Rich List families, or just close-up magic at major venues for corporate Christmas parties across the region and beyond, December was certainly fruitful and fun. Archie and Bert were hard at it in Merthyr Tydfil in December. Entertaining quite a sizeable crowd during the day, they it was fun to amuse and baffle the locals as they enjoyed the Christmas market and the ice-rink. 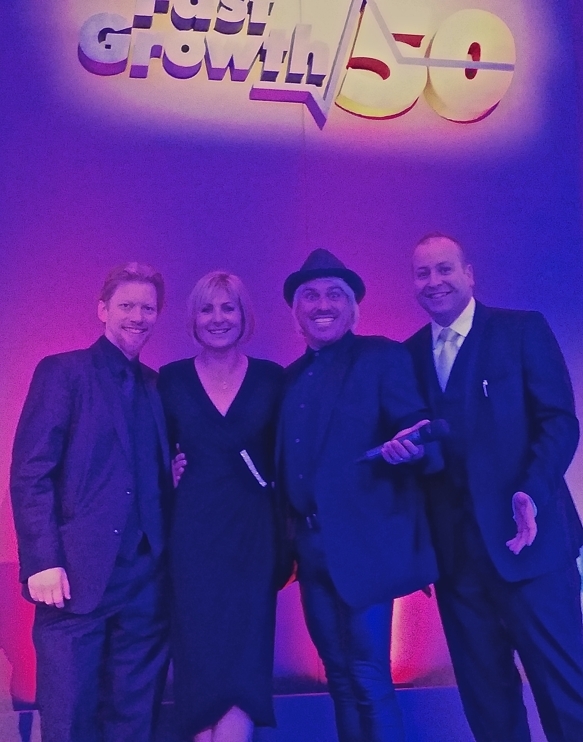 It's the fifth year in a row now that Jasper has been asked to supply and head-up a team of magicians for one of Wales's top business events - The Fast Growth 50 Awards. As well as doing the magic, Jasper is always asked to play 'the voice of God' and announce media host Sian Lloyd onto the stage (pictured). 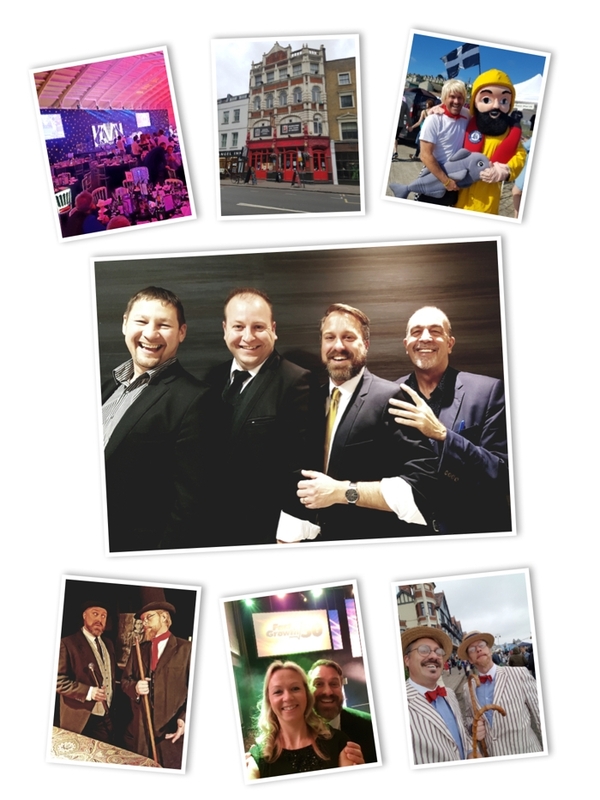 The event is held at The Mercure Holland House Hotel in Cardiff, and the awards are a highlight on the Welsh Buisness calendar and Jasper and his magic colleagues work harder every year to make sure the ever swelling ranks get entertained. This year (as you'll see from the photo), Jasper asked the organisers if he could come as a character - step up American 'Brad'. It's always good to try out fresh ideas and Brad certainly grabbed the imagination of many tables, several insisting he re-visited them just to shout his bizarre catch phrases. Many thanks to Frank E Haschka, Bryan Gunton, and (not pictured) Phil Jay - a great team of magicians as co-organsier Angela Jones-Evans also comments "Many thanks to you, your colleagues and of course 'Brad' for excellent entertainment as always on Friday night. Your skill and mastery never fail to amaze me"
It's always fun to meet new people, and extra work has certainly provided Jasper with ample opportunity to enjoy himself on his days off. Whether it's several episodes of Casualty playing a shopper, a paparzzi photogtapher or a rioting football hooligan assualting police officers, the best day was on the big budget U.S. historical drama - Davinci's Demons. You'll see from the photo below that Jasper was made to look filthy, was dressed in leathers and a fanstastic wig. 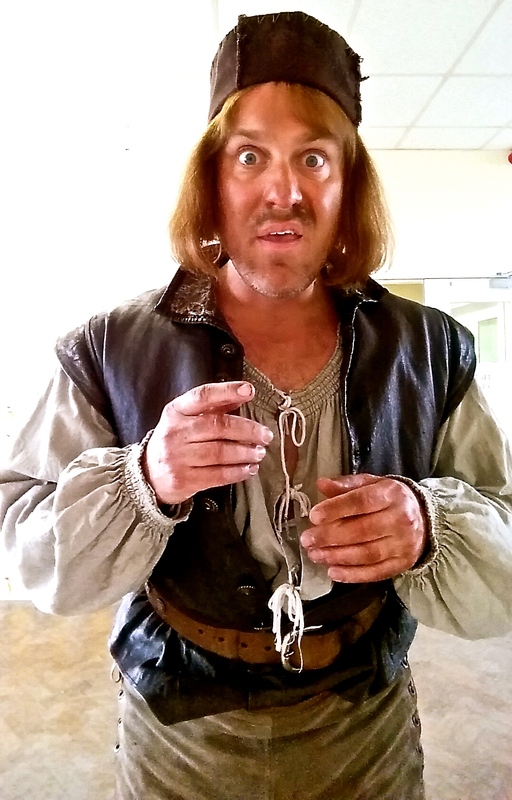 After far too many hours drinking shandy from a tankard and pretending to rejoyce after a battle with sixty other extras, it'll be amsuing to see if he manages to gli,mpse himself in the final edit. So where did the last few moinths go? - luckily there's always a diary on hand to jog the memory and remind yourself exactly who you've been entertaining. Whether it was Kockov headlining multiple dates at the Glee Clubs in Oxford, Nottingham and Cardiff, or appearing at a wealthy private garden party in Sussex, lecturing to a magic society in York, or performing at anniversary dinners for societies in Coventry and Leciester. Add to all that several weddings as Jasper and Kockov, compering as Jasper for a large Charity Ball, performing at three circus-themed events, or just doing close-up magic at black-tie dinners - it's been busy. But it was two football-related events that stick in the mind this summer season, first up you'll see photographs below of a large 'Mackevents' sports event held in Barry, south Wales. 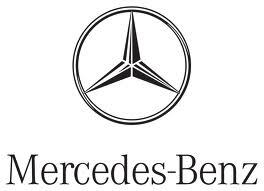 Mackevents brings famous past and present sporting stars to the region and they always sell-out their 'evenings with'. 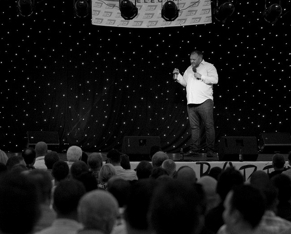 Keen to have an 'act' warm up the crowd, step forward Kockov performing a 45 minute opener for football legend Razor Ruddock. It was a great crowd and Mackevents co-founder Ross Macintosh was delighted - "You were amazing !, everyone loved you"
The second football-related performance introduced Jasper's forty-first character, vintage football refree, Arthur Sixpence. Along with his stilted football friend (Pick-N-Mix Circus's Russell Wells), Arthur organised comedy penalty shoot-outs with the young crowds at a south Wales community World Cup-themed street party event. It was soccer silliness from the second he blew his whistle and along with real football skills performers and Brazillian dancers (pictured) it was a great day. 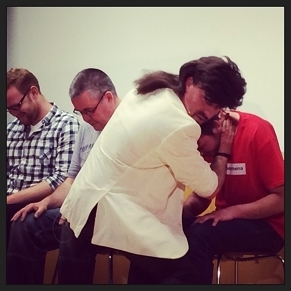 "we were all rolling around in our chairs" - "I laughed uncontrollably and my face hurt at times"
Hypnosis is just another of Kockov's talents and where better to show of his skills than at a prestigious hypnosis conference in London. "Kev Sheldrake (organsier) and I had conceived an ongoing narrative throughout the day whereby we had informed everyone of the travel progress of Kockov. What can I say, he exploded onto stage. I laughed uncontrollably and my face hurt at times. Kockov framed his performance wonderfully with reference to MK Ultras, George Estabrook’s notions of military hypnosis and uses of it in his native (now exiled from) Russia. The manner he has was such that he could get away with saying pretty much anything and hilarity ensued. There is so much to say about this performance that again, I cannot do justice to in a media-friendly soundbite here on my blog. His hypnosis inductions were a chloroform approach, an injection (which had a belt tied around the arm with the other end in the ‘subject’s’ teeth as he found a vein, hahahahaha) and a carotid hold that resembled a Jack Bauer interrogation move knocking out a victim quietly (see photo above). 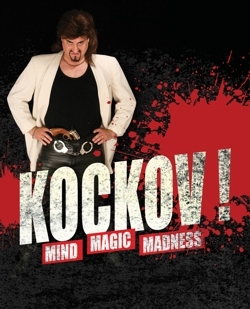 He was so funny and so entertaining that the effects (mentalism/magic/stage hypnosis, shooting guns) which would be the highlight of any other show received equal rounds of applause to the sheer direct responses to the gags and brazen attitude of Kockov throughout. The entire place was energised massively and we were all rolling around in our chairs. Kockov’s introductory recordings were direct quotes from MKUltra and George Estabrooks. His inductions using (faux) chloroform, injection and carotid grip are all direct references to things that are indeed in the literature. Kockov’s creator, Jasper Blakeley then went on to demonstrate how he comes to be so good. 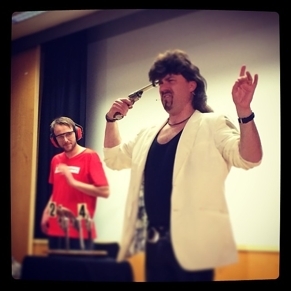 During the Q&A, he picked up on the structures of a number of facets of previous presentations that day, illustrated and identified how they employed comedy and what made them effective and showed that he is so much more than a mullet, leather trousers and scythe-like sense of humour… The day ended in rapturous applause." It was a fantastic day and Jasper thoroughly enjoyed meeting so many academics, practicioners and performance hypnotists. Went to see Kockov last night - have not laughed so much in ages! A very funny and talented guy. A great venue and a very welcoming host. Will definitely be going again. My partner took me to Smoke and Mirrors for a Valentine treat to watch Kockov. It was one of the best nights out we have had in ages! I laughed until I cried, and the magic was amazing. The atmosphere was great, the staff were very friendly and helpful and Kockov is either a madman or a genius....actually probably a mixture of both! I would wholeheartedly recommend this venue to anyone looking for a night out that is lots of fun and a bit different. “The best come in little packages"
...which if you inserted a punch line here would be along the lines of Kockov's humour which made this a side splitting adult evening where we all laughed so hard our side's ached. 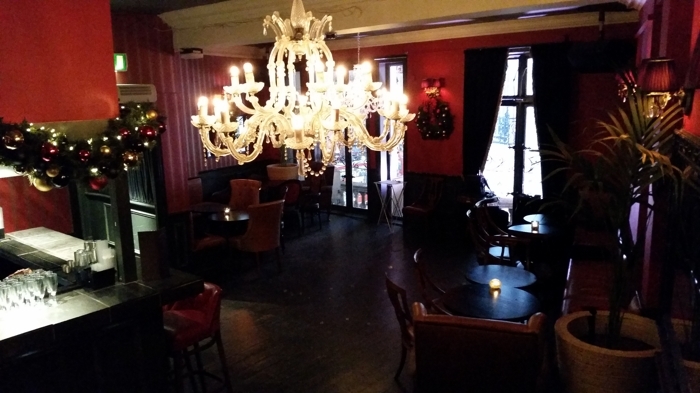 The venue is like a nice, friendly wine bar up front and the back (where the shows take place) is small and intimate, set out a bit like a jazz club with your small tables and seats around. Kockov himself was slightly less about the "magic" as there was also a focus on comedy as well - but that didn't disappoint at all - it was a laugh a second ... and serves to makes me more excited for my next visit to see the house magicians!! A warm greeting, plenty of booze, an electric atmosphere and a very, very funny and clever act by Kockov. "He really can control your mind...!" We have booked tickets for another show next month...and are taking friends to share the experience. Catch Kockov at Smoke & Mirrors again this November and the next Valentines weekend 2015 ! 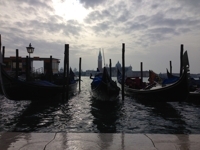 What a great start to the year with a 40th birthday party for 120 in Venice. 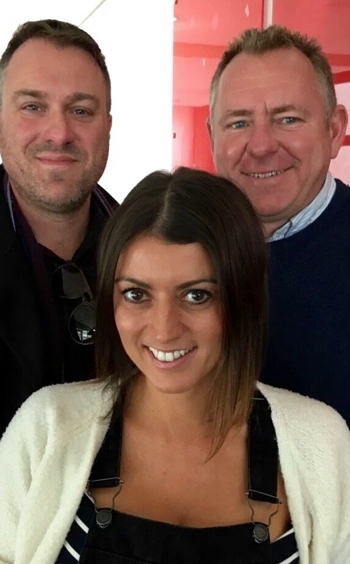 Following on from a fabulous private Christmas function for hedge fund company Marwyn (see story below), one of the partners, Mark Watts (pictured far left in photo below) was so thrilled with meeting Kockov, he insisted on flying him out for his birthday bash. 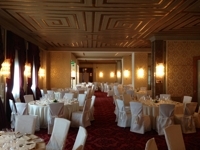 Taking place over three days in several venues, with drinks receptions, DJs, bands, singers, dancers, treasure hunts and a black and white masked ball, Kockov was booked to send everyone off in style at Sunday lunch. With more than a dozen different nationalities, personalities, popstars, models, artists, actors and actresses amongst the guests, Kockov fitted right in to this eclectic and lively bunch. After amazing the guests with walk-about close-up magic, it was a mind-reading cabaret topped off with a specially re-written and sung Italian Aria. Much fun entertaining characters who rivalled Kockov himself by being truly outlandish. 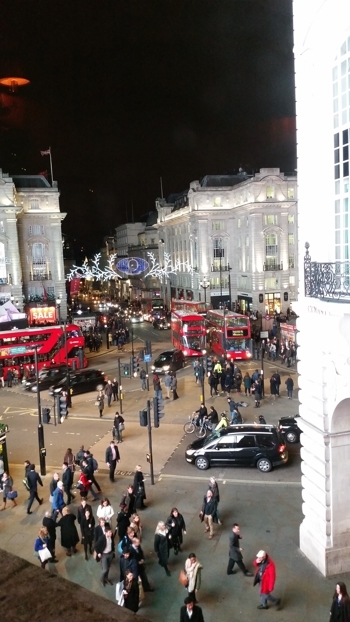 The Christmas run-up saw some amazing gigs come in and none more so than a lunchtime event for a London-based hedge-fund company Marwyn. A private function room at The Groucho Club in Soho was the venue and with Kockov performing close-up magic between the courses followed by a full mind-reading cabaret, it was an awful lot of fun. 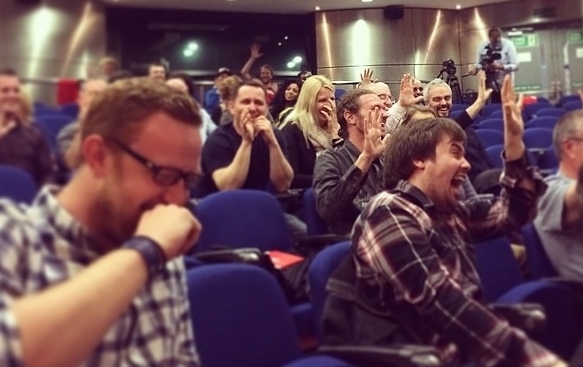 It was a real delight performing for a truly wonderful group of enthusiastic clever people. After the second year co-hosting the Lloyd's Bank Charity Ball as Kockov, appearing as celebrity TV chef character, Jamie Olivoil, at St. Fagan's Food Festival, Close-Up magic at the Hilton in Cardiff for Admiral Insurance's international conference, the fourth year in a sucession employing three other magicians to work the five hundred seated guests at the Fast Track 50 Awards, the insane flurry of work became a bit funnier. The Mad Hatter's Ball was a corporate event where Jasper was asked to create a bespoke 'Mad Hatter character', who would encapsulate the Alice in Wonderland theme for an entire evening. As a walkabout 8ft giant rabbit illusion, introducing the evening with a specially composed song, hosting a raft of awards, presenting close-up magic around the dinner tables, hosting 2 raffles, a prize draw, performing a themed thirty minute cabaret complete with a floating lady, finishing up with a stand-up mini-parlour show in the bar - Jasper was relieved that it all went to plan and the client was thrilled. With incredible balloons by the talented Dr. Bob and a professional photographer to capture the event, it was certainly a night to remember. 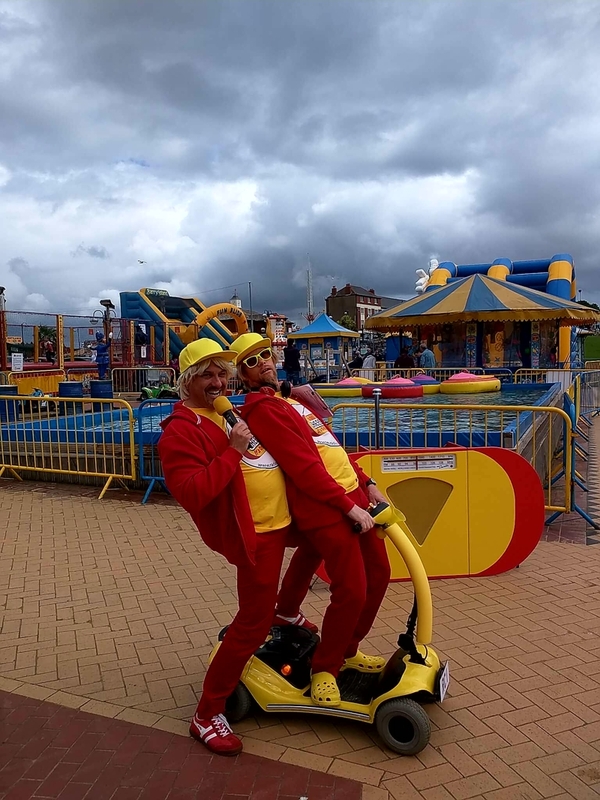 After an incredible reception from the entertainment industry at a showcase event last year, Kockov found himself with several dozen 'family-friendly' UK holiday park gigs this summer. 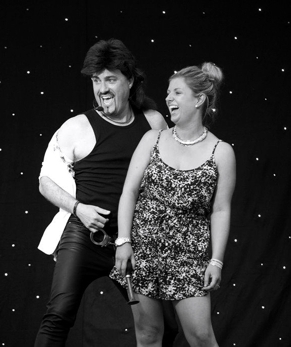 Whether it was Weymouth, Burnham-On-Sea, St. Austell, Padstow or all points inbetween, the reception was always friendly and very appreciative with some park residents claiming it was 'the best act we've seen in years'. If you've only seen Kockov doing stand-up, then the thought of him doing a 'clean' 45 minute act might seem difficult, but fortunately having worked for so many events such as weddings where language and content has to be child-friendly, this wasn't too much of a stretch. 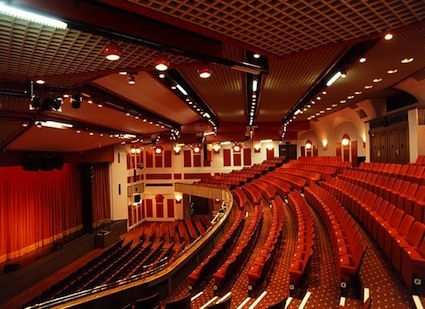 With some venues (like the one pictured) having around a two and a half thousand person capacity room to play to, any intial concerns of being able to hold the audience's attention were soon forgotten as soon as the laughs started to roll. and by the end of the night my sides were aching"
I CAN'T say that there have been many Saturday nights in my life where I have been entertained by a mullet-haired, leather-trousered Russian. But this weekend was different. And entertained I was - by Kockov the master magician. 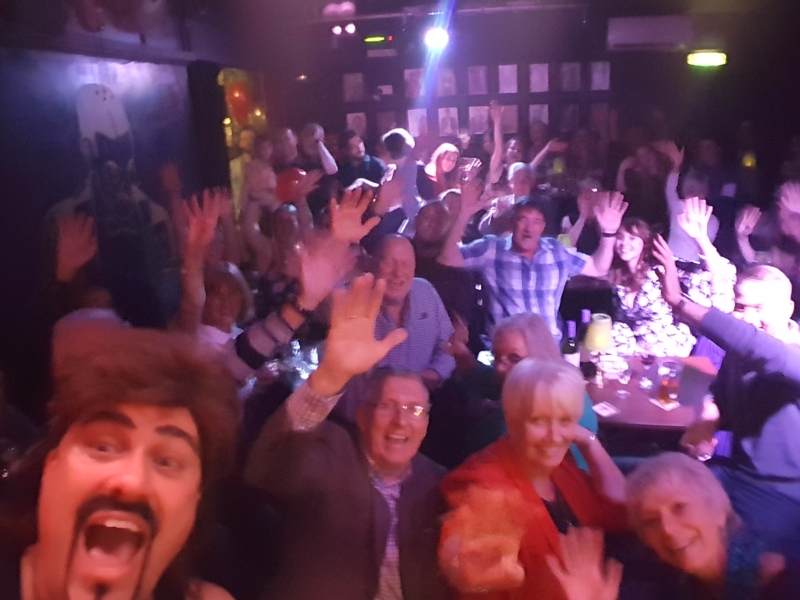 Kockov - a Monrokvian master mind reader and magician - had the crowd in the palm of his hands when he took to the stage of the Smoke and Mirrors boutique magic theatre pub. 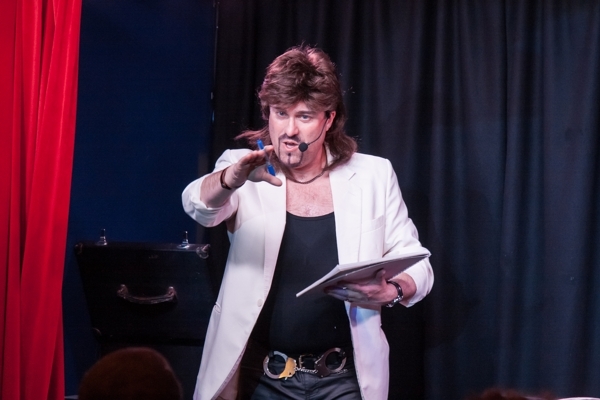 Dressed in eye-wateringly tight leather trousers, with a mullet that many 80's pop stars would be proud of, Kockov - aka Jasper Blakeley - performed a non-stop repertoire of mind bending tricks. 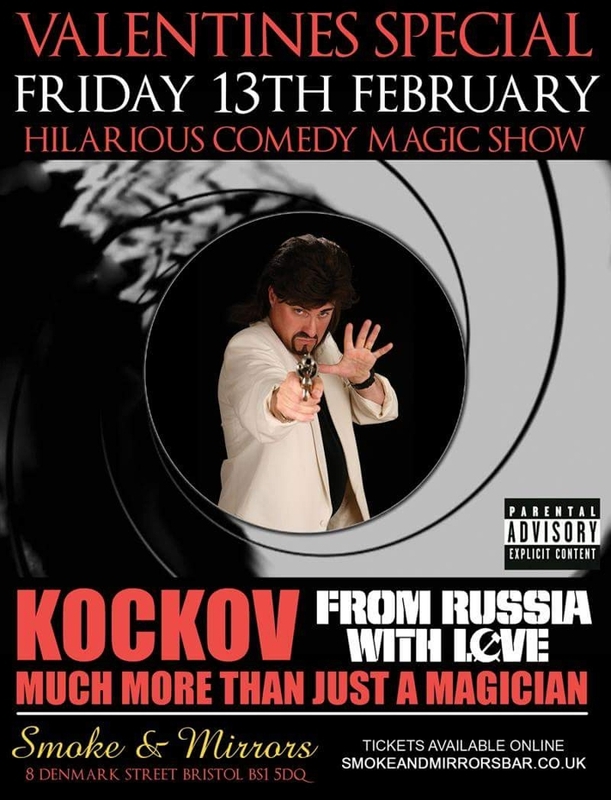 But his magic routines are just part of the show as unlike some other magicians, Kockov makes his magic and illusions side splittingly funny and he had the audience in stitches with his off the cuff remarks and outrageous humour. From using word association and his mindreading skills to guess a name of a film a member of the audience had chosen to a series of impressive card tricks to guessing phrases and words in six random books - the pages and phrases chosen by the audience. Although there are many who can produce similarly stunning magic, there are few performers who can combine this skill with the quick wittedness of a comedy club performer whilst maintaining the illusion of being another character. Kockov, however, is such a man. The show was interactive to say the least with many of the audience were taken up on the stage to take part in the tricks. But that was what made it so much fun to watch - and everyone was more than willing to be crazy Kockov's assistant. At times I was laughing so much it was hard to see and by the end of the night my sides were aching. One of my favourite lines was when he asked the audience ' Have you seen the new constipation movie? "No? It ain't come out yet!" As a trained actor, Jasper has combined the art of magic with acting. 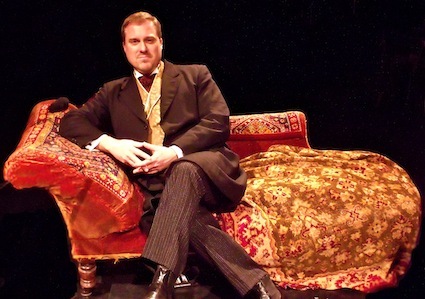 He has created more than a dozen characters for his act from a vicar to a Victorian cockney street hustler. I just can't wait to meet them! Smoke and Mirrors as a boutique magic theatre pub - the only one of its kind in the UK - offers something different and exciting for the city. The fact it is quite bijou makes provides quite an intimate setting for a show and by the end of the night the audience all felt we had shared something special. Smoke and Mirrors offered a fantastic, fun, laugh a minute night out. I will certainly be making a return visit. 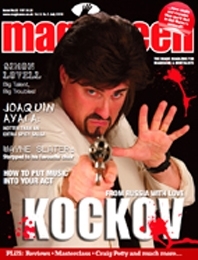 Especially next time mullet haired maestro Kockov is in town! It's been another extraordinary few months for Jasper and diversity doesn't quite cover it. February, Jasper was flown to Edinburgh for Kockov to headline a stand-up gig for 'Off The Kerb' at The Pleasance alongisde the excellent young comic, Ivo Graham. March saw Jasper being flown to Israel for 4 days to do a lecture and workshop to The Israeli Society Of Magicians, after which he lectured and performed for a South Wales business forum, followed by several stand-up gigs including Harper Adams University in Telford. 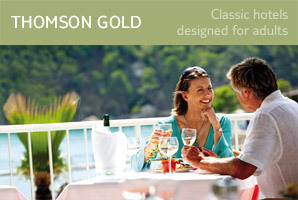 April was the start of Kockov's foray into holiday park shows for top UK booker, Trevor George. After the first of many appearances this season at various Weymouth parks, Kockov appears to have gone down very well with the audiences. 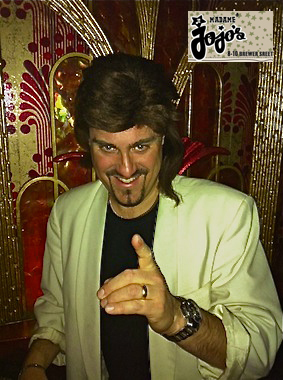 At the end of April Kockov entertained the great and the good of Welsh Media at a swish private party in the capital. May was quickly upon us and Kockov wasted no time getting the laughs at a pre-F.A. Cup Final event, working the tables and the auction for a posh ball in the beautiful surroundings of Caerphilly Castle, entertaining more holiday park goers at several loactions in Burnham-On-Sea, before finishing off the month at Cardiff Bay's 5 star St. David's Hotel & Spa for a private party with close-up and cabaret. After the success of Kockov's recent showcase, he was invited to appear at another 'bookers' event for Thomson Holiday's senior management. 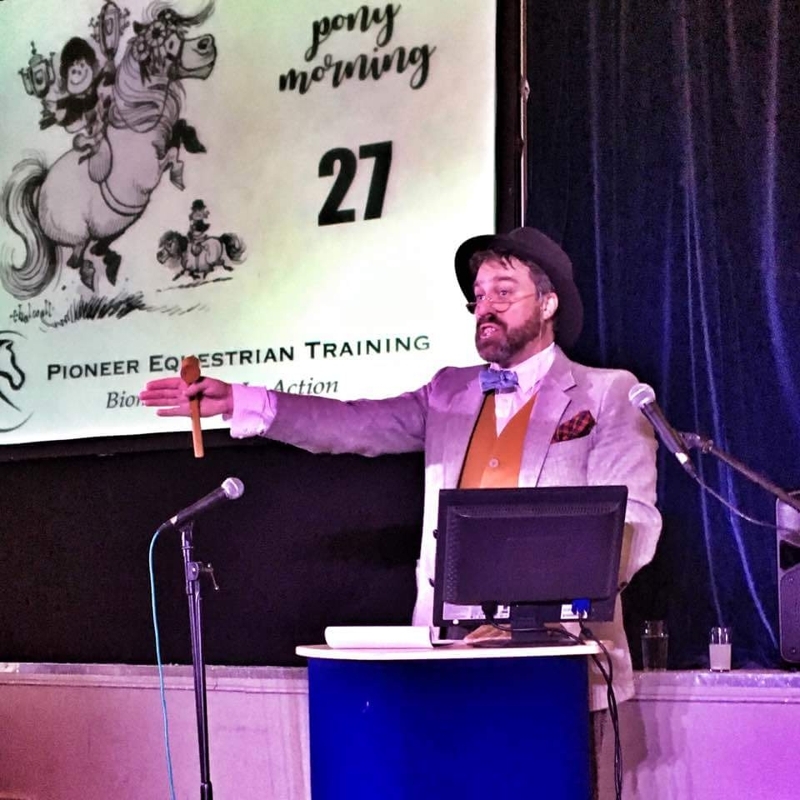 Jasper was amazed to be amongst some really great acts that evening, and with some lovely comments and feedback, expect to see the Monrokvian Magician appearing at some of Thomson's upmarket Gold Resorts throughout Europe this summer - more news on this as it happens. This was the great quote given to Kockov by the performer's industry bible - The Stage, following his appearance at a recent showcase for UK-wide entertainment bookers. Jasper was over-the-moon to receive universal praise from the organisers and bookers alike, many of whom regarded him as the best act out of more than three dozen comics, magicians, singers, acrobats and speciality acts over the two day event. However after the showcase, all these kind words mean nothing unless they translate into bookings, fortunately with over a dozen contracts already signed for appearances in 2013, things are looking great for Kockov. Thank goodness for a mild past few months given all the driving Jasper's been doing. 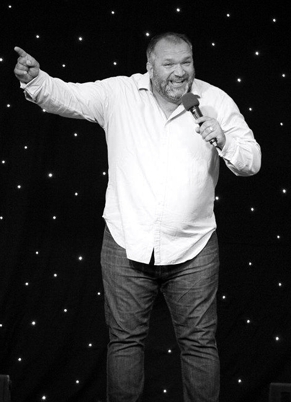 With headlining stand-up gigs at universities in Reading, Essex and Birmingham City, plus he's topped the bill at sell-out gigs, including Portsmouth's Wedgewood Rooms, Pocklington Arts Centre nr York, two nights at Bournemouth's Funny Bone and three nights at Exeter's Corn Exchange. Regionally Jasper's been in full character mode appearing again at Merthyr's Christmas light switch-on, in Abergavenny for street-magic walkabout as Cockney hustler, Archie Grott, and at the five star Vale Hotel/Resort for their Christmas Party. 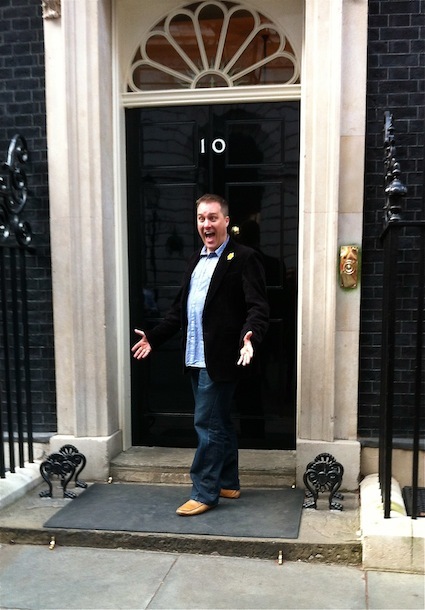 Charity-wise, Jasper's was delighted to entertain at events for children with Scoliosis, Kidney Wales and the annual Dreams & Wishes trip to London, including a visit to see The Speaker in his chambers at The House Of Commons. But the most extravagant 'do' Jasper was part of this season, was for Insurecom, at the London Times Insurance Awards in Chelsea. Held at the Evolution venue in Battersea Park, this utterly vast building was transformed into Communist Russia. Being 'The' annual event for the UK Insurance industry, 1500 guests were treated to a multi-course sit down dinner and a glittering awards ceremony complete with 5 purpose-bullt bars, a V.I.P. mezzanine along with an aerial-suspended stage for Kosack dancers and entertainers. With a vast video screen backdrop and a giant stage, the whole thing appeared as big as the Brit Awards or at least an X-Factor Final !. 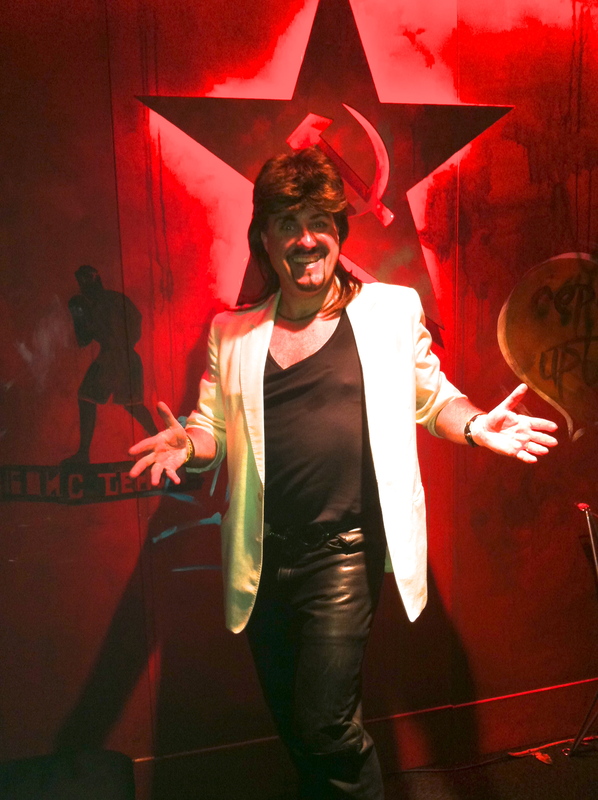 Kockov was asked to perform close-up magic in one of the Soviet-themed bars (pictured above) and was happy to be invited to join the client for dinner at their table. The finale of Kockov's evening was his gambling of a thousand pounds of his own cash, beautifully displayed by a fur-hatted Russian-esque beauty. The client was delighted with Kockov's profile-raising of their brand , especially as his efforts were featured twice in the following month's trade magazine. 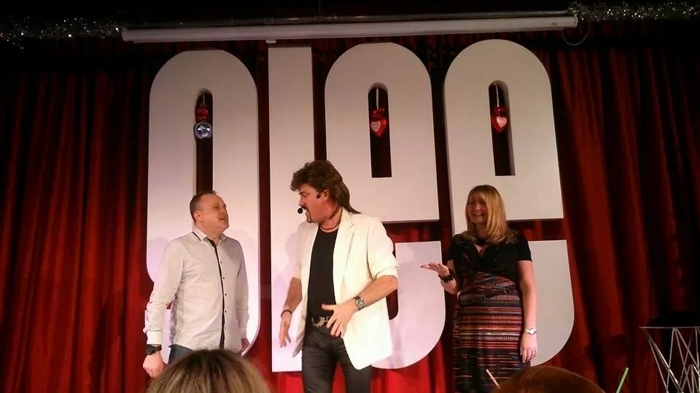 It was another busy month, with Kockov appearing at headlining stand-up gigs in Kent, Chichester, Glamorgan, Birmingham, The Isle of Wight and Southampton, providing entertainment for Whitbread's opening of the new Premier Inn/Brewer's Fayre in Barry, but the biggest event for him was at the Lloyds TSB annual charity dinner at The Mercure Holland House Hotel in Cardiff. 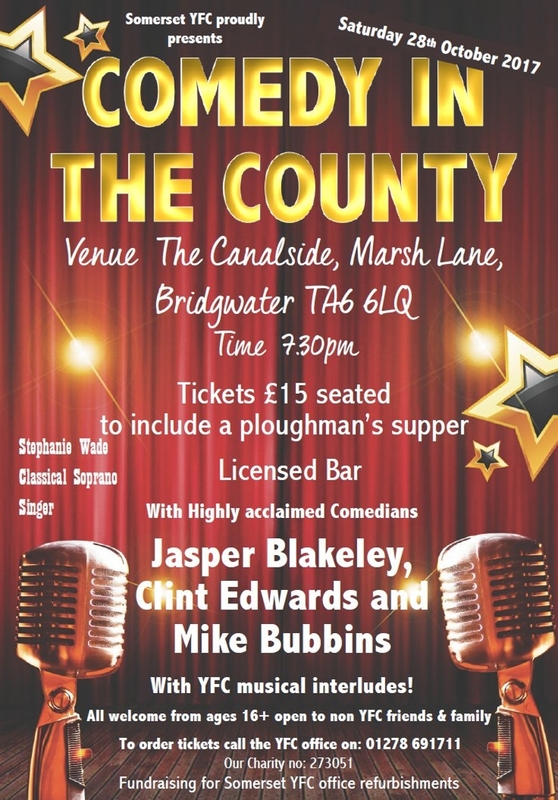 After entertaining several hundred people with close-up magic and a cabaret, Jasper was delighted to be immeditately re-booked for the event in 2013, but next time as the evening's host. 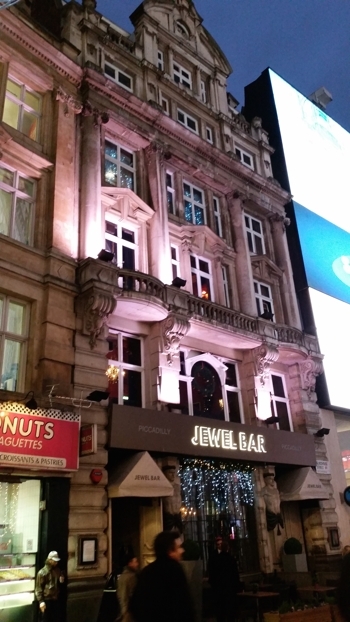 This wasn't the only bank booking of October, as a last minute call from HSBC saw Jasper heading to a five star hotel in London to bring a roomful of executives 'together' - "Jasper provided, at very short notice, an excellent "team bonding" event. He responded very well to the different dynamics and personalities of the team to ensure that everyone got involved, had a good time, and learnt something too. It was an evening that will be talked about for a long time, I'm sure!" Rachel Shatliff, Regional Risk Manager. With the festive period just around the corner, be sure to call Jasper soon to ensure he's available to provide some unforgettable entertainment. 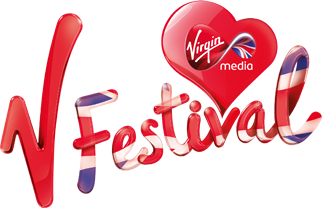 Kockov is delighted to announce that this August, he's joining the Glee Comedy Tent line-up at this year's 'V Festival'. Appearing at the Hylands Park (Chelmsford) event on Saturday 18th and Weston Park (Birmingham) on Sunday 19th, Kockov is looking forward to entertaining the two thousand strong crowd. Following the likes of Kevin Bridges and Milton Jones last year, Kockov is thrilled at the prospect of sharing the stage with the incredibly funny and talented Tim Minchin in 2012. 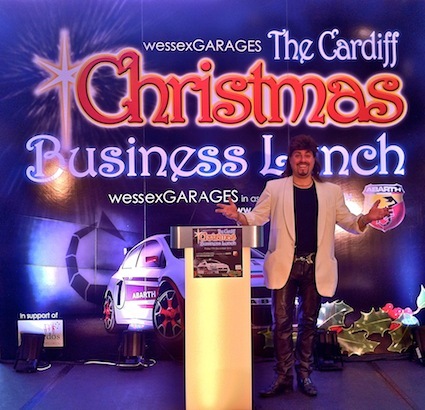 Where as corporate events are generally booked months in advance, including recently (entertaining with close-up magic) a lovely company of transport consultants at The Vanilla Rooms at Park House in Cardiff, the stand-up world can be a bit more immediate. A good example of this came when Jasper was asked to do a headlining set and a 420 mile round-trip with only a few hours notice. The venue was The White Rock Theatre in Hastings (pictured), a long drive but a great audience. This month's also seen him headlining sell-out gigs in Henley-On-Thames and Exeter's Corn Exchange (where he's topping the bill for three consecutive nights this December). All this means that Kockov is definetely getting about a bit, plus over the last couple of months he's had the pleasure of working alongside some other amazing circuit comics including, Tom Deacon, Alan Francis, Jen Brister, Simon Fox, Suzi Ruffell, Gary Delaney, Paul Ricketts, Carey Marx, Mike Bubbins, Damo Clark, Dan Thomas, Chris Martin, David Mills, Andre King, Josephine Lacey, Justin Panks and many more. Don't forget to click on his follow on Twitter link at the top of the page. 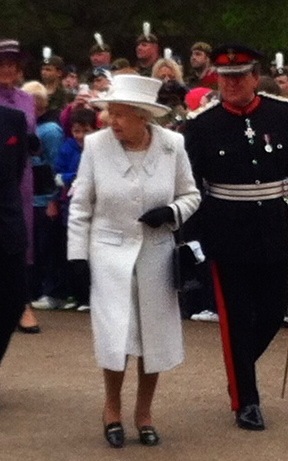 The weather might have been a bit damp, but this month's reception given to the Queen as she started her Jubilee Wales tour, was anything but. Several thousand people, including Welsh Royalty - the Six Nations winning Welsh Rugby Team, Rob Brydon and Max Boyce , filled Margam Park and awaited the arrival of The Monarch. 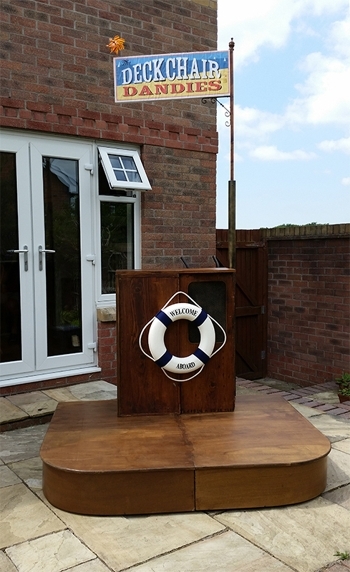 Jasper was delighted to be invited to provide entertainment for such a prestigious guest and he was amazed to see just how much logistics and timings go into the visit of the world's biggest V.I.P. 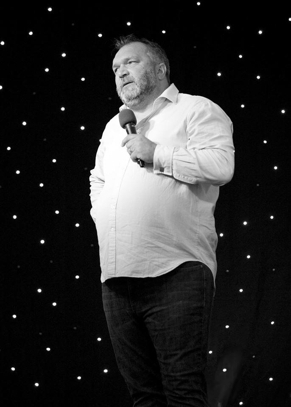 March was another 'full-on' month doing Kockov stand-up gigs all over the place. 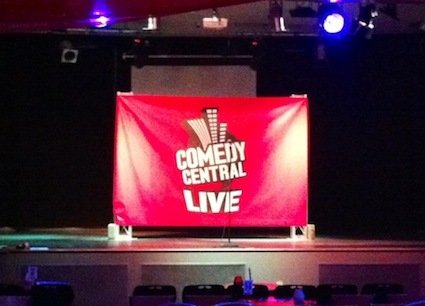 Headlining sets at the Birmingham Glee Club, Cardiff Glee Club, HA8 Comedy Club in Edgeware - London, Trinity Theatre in Tunbridge Wells, Quay Arts - Isle of Wight, Komedia in Brighton and finally headlining Reading University's Comedy Central 'Live' gig for Universal/Off The Kerb (pictured above pre-show). So a couple of thousand miles driven over the past few weeks with only a few tense days during the 'fuel scare'. 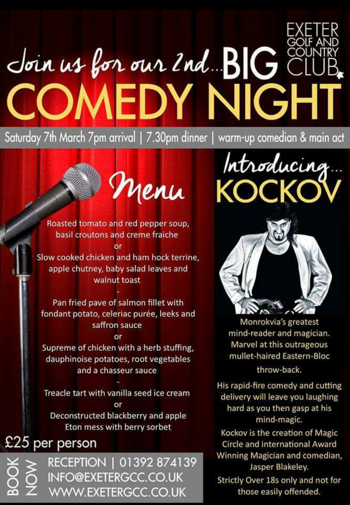 Good news too if you want to see Kockov live, as Off The Kerb have just booked him for more than a dozen new dates this year click on the 'Stand Up' link on the menu above for details. Finally all released, the three books Jasper's just been published in. 'Best of British' (pictured centre - see article further down this page for details) was launched at this month's 'Blackpool Magic Convention', the world's largest gathering of its kind, with over three thousand card-shuffling, lady-sawing and mind-reading bods. The more serious book, 'Mentalism Reveals Volume 2', by Mark Elsdon (pictured middle), was also thrust onto the magic community at the convention. 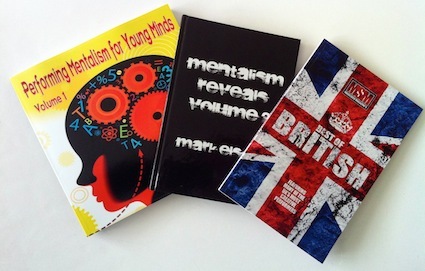 The last book (pictured left) is 'Performing Mentalism for Young Minds', by Jasper's New Zealand friend Paul Romhany. Jasper provided previously un-published mind-reading effects for two of the books and in the third he discusses creating characters and how to improve your performance. Speaking at the book launch, Jasper reckons "In this electronic world, there's something very satisfying and permanent knowing I'm sharing my ideas and knowledge with other like-minded individuals, plus I'm bound forever in the same volumes as some of the most creative thinkers and performers in my field". 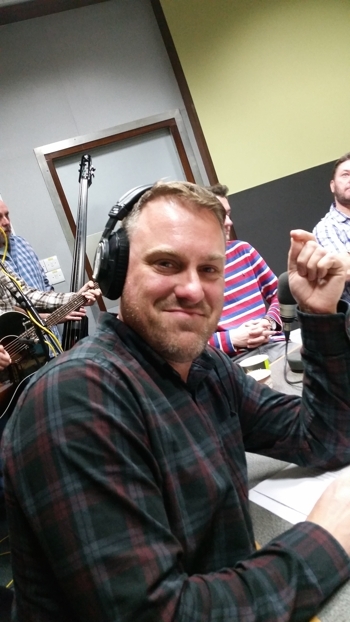 Being a qualified journalist has always helped Jasper when it comes to writing or broadcasting (most recently on BBC Radio Wales - see earlier posts), but over the years he's been approached by educators to divulge some of his skills. 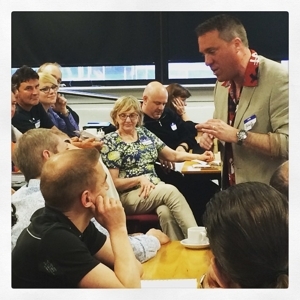 Having spent time lecturing professional entertainers in magic and performance, both in the UK and abroad, it was the natural progression to do some university lecturing. 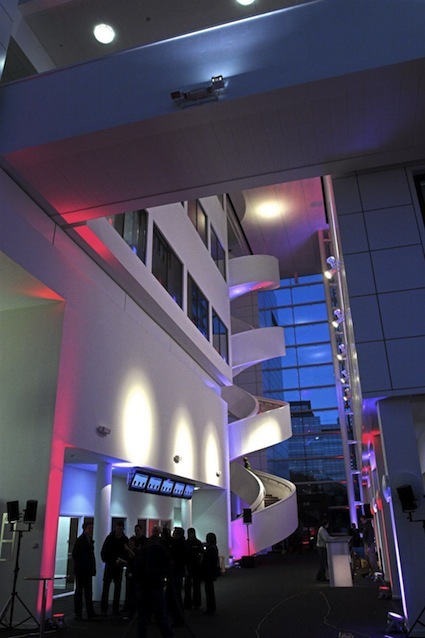 As part of The University of Glamorgan, The Atrium in Cardiff is an amazing media facility, catering for all aspects of broadcasting and journalism. Jasper was delighted to provide specialsed voice technique practical lectures to around two dozen broadcast students during January, and such was the positive student response, that funding is being sought to introduce Jasper's teaching across other years and courses. 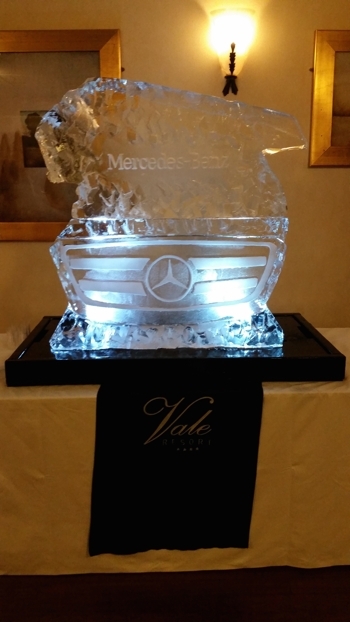 Following the amazing reaction to Kockov's close-up and cabaret appearance for Mercedes Benz at their corporate event at The Vale Hotel in South Wales earlier this month, he was re-booked by Audi to perform at their event at the same venue the following week ! - plus it's time to renew the passport too as Jasper's to be flown out to an exclusive chateau in France at the end of the summer to entertain with close-up and cabaret at what promises to be an extraordinarily lavish wedding. This month you may also have caught Kockov doing his stand-up at Funny Bone Comedy Club in Bournemouth and at The Glee Club in Oxford. 'Featuring routines from many of the UK's most creative performers' - and exciting to say that an original mind-reading routine from Jasper's recent 'Mind-Messer' show is featured in this much anticipated magic book release. 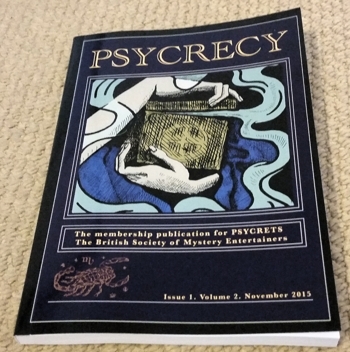 It's always great to get the right response from an audience for your own magic or mind-reading effect, but it's another thing to be asked to be part of the international release of a 'best of British' magic publication. Following on from Jasper's 'Magicseen Magazine' front cover appearance and interview over eighteen months ago (see bottom of this news page for details), Jasper was asked to contribute an original stage effect to a glossy instructional magic volume, so obviously he jumped at the chance to be imortalised in print. 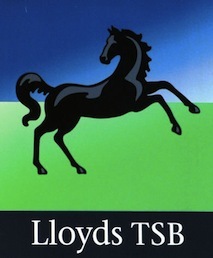 Watch out for Jasper popping up in books again in 2012, as he's just signed deals to appear in several other publications in two other countries, one is about the art of performance whilst the other is about mentalism. It was an hectic and eclectic time this December for Jasper. 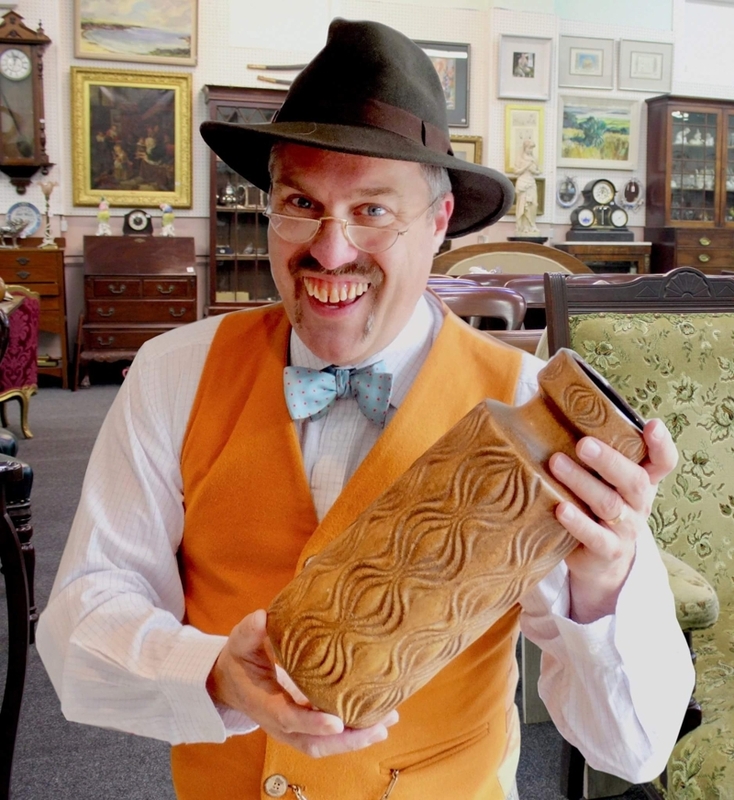 Amongst the bookings were corporate events at 4 star hotels in Wales's capital, Archie Grott made appearances regionally and in London, the latter being an extraordinary lavish £150K plus corporate affair for estate agents, complete with purpose-built Victorian gin palace beside a fake cobbled street, benches and lamps ! - what recession? . Kockov didn't miss out on the mince pies, with festive headline appearances at a decked-out Oxford Glee Club (pictured) and several more at Cardiff's Glee Club, including a fantastic New Year Eve's gig at the Cardiff Bay-based comedy venue, where the Monrokvian Mullet-Meister helped welcome in 2012 with a packed house of 450 ! Thanks to everyone who helped make 2011 such an amazing year for Jasper and his alter egos - here's hoping 2012 brings more fun and success. What a brilliant finish to the month with Kockov headlining both the Glee Club in Cardiff and Oxford. 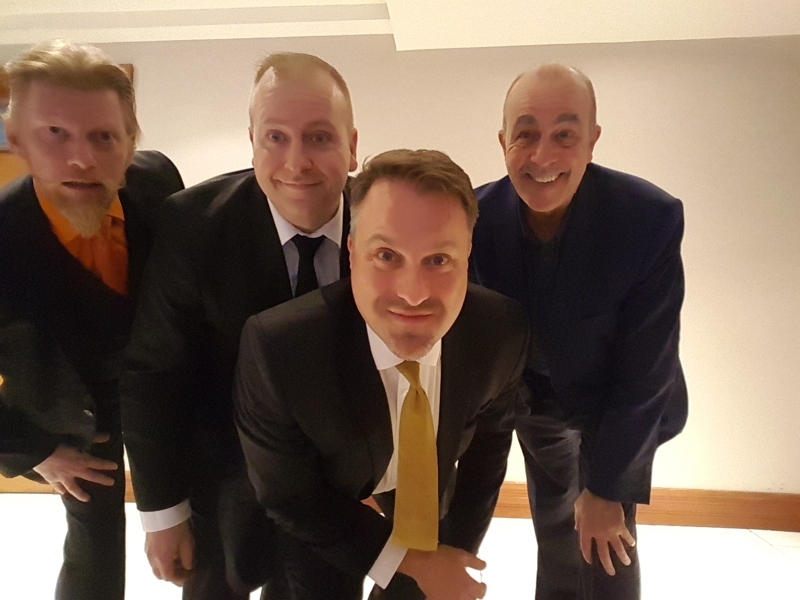 After a fun Thursday night topping the bill in Cardiff with Mike Bubbins, Dominic Frisby and Andy Robinson, Saturday night in Oxford produced a few tears - of laughter. Jasper has admired Ninia Benjamin (pictured) since seeing her in BBC3's ' 3 Non Blondes' , so what a thrill to have her introduce him as the headliner and then proceed to howl and cry with laughter at his act. Such a great night with the very funny and charming Ninia along with two other lovely funny comics, Romesh Ranganathan (pictured) and 'Windsor'. Don't forget to click on the 'Stand Up' tab in the menu above to see when and where you can catch Kockov doing live stand-up next ! Jasper got the chance to meet Welsh 'Royalty', and couldn't resist a cwtch (cuddle). Bonnie 'Total Eclipse of The Heart' Tyler was appearing at a blacktie event that Jasper, and his magical mate Phil Jay, were working at The Cardiff Hilton, and she was delighted to be asked to be the rose between two thorns. This is the second year in a row that Jasper's been asked to work this prestigious Hilton event and is looking forward to his invite next year too. 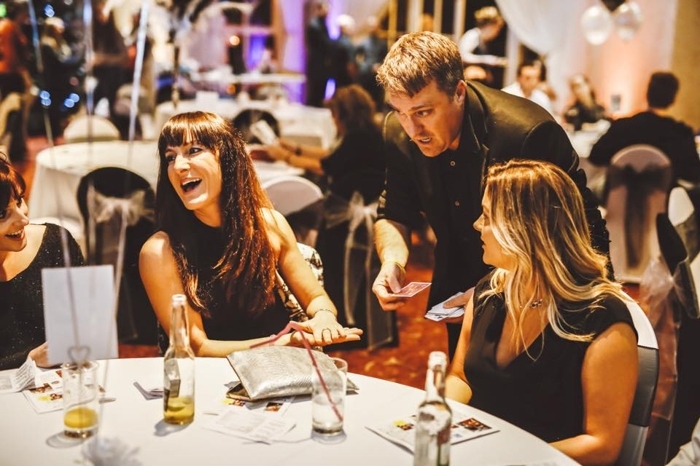 For the second year in a row, Jasper was asked to head-up a team of magicians for one of Wales's top business events - The Fast Growth 50 Awards. 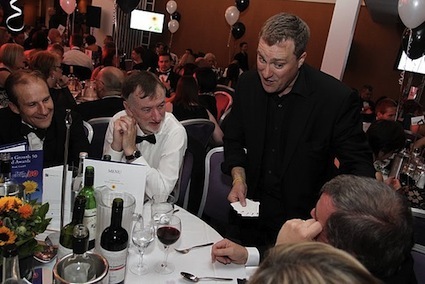 Held at The Holland House Hotel in Cardiff, the awards are a highlight on the Welsh Buisness calendar and Jasper and his magic friends are always on hand to make it a night to remember. With several standing ovations from tables plus plenty of laughter, the organisers seem keen to employ Jasper's services in the future, especially since they were delighted by his extra compering work on the evening. After the hectic effort of putting on The Glee Club one-man show, you may have caught Jasper out and about in various guises. After being flown to Istanbul in late March to lecture to Turkey's leading magicians, including Jasper's friend and winner of Uri Geller's TV show 'Phenomenon' - Berk Eratay, there was entertaining at The SWALEC Cup at The Millennium Stadium, a cabaret appearance for a prestigious charity fundraiser for a client in Devon, several more appearances on BBC Radio Wales as a news pundit on Jason Mohammad's show, hosting a corporate client day at Bath Races celebrating 200 years, compering as an act at The Glee Club Cardiff for the first time and entertaining at a black-tie event at the SWALEC Stadium (home of Welsh cricket) for a corporate client. 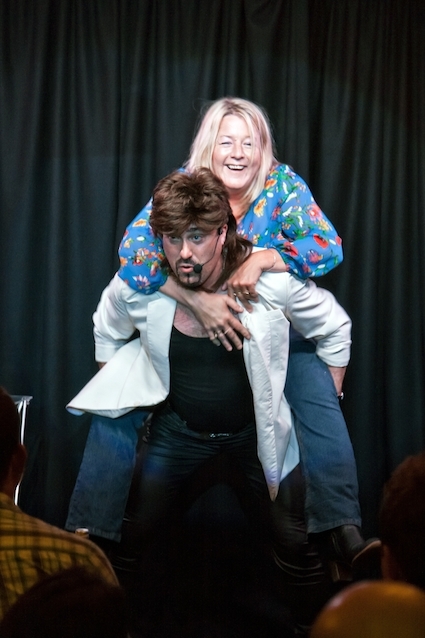 Jasper Blakeley as ‘Kockov’ had the audience roaring with laughter in his new show at The Glee Club, Cardiff. 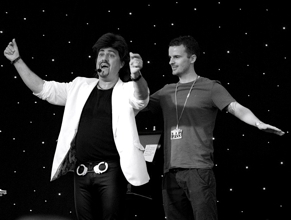 Performing as a Russian mentalist, his blend of outrageous humour and mindreading left everyone in hysterics. The show featured a number of original, new routines including Russian Roulette with food blenders, the prediction of an audience member’s pin number, and the prediction of items placed in a spectator’s jacket. Perhaps the most deceptive and entertaining effect of the evening involved the prediction of a number randomly generated by two darts thrown at a dart board. Magic aside, Kockov’s hilarious handling of volunteers, quick adlibs and ability to tease and entertain an audience make his show well worth watching. For a first night of all new material, this was bold, brave and full of energy. As with all performance, improvements can be made, joins can be tightened and scripts can be sharpened, but Kockov has certainly found a niche for his act. Judging by audience reaction, everyone had a great night. 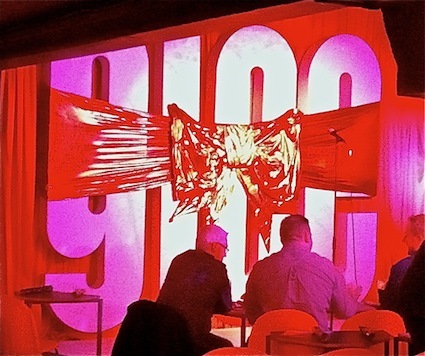 The Glee Club is a stylish venue and great for magic. It was refreshing to see a packed audience on a Wednesday night, and no doubt Jasper will be considering touring his show to other comedy clubs in the UK. This performer has landed on his feet, and surely this is a sign of a promising future. 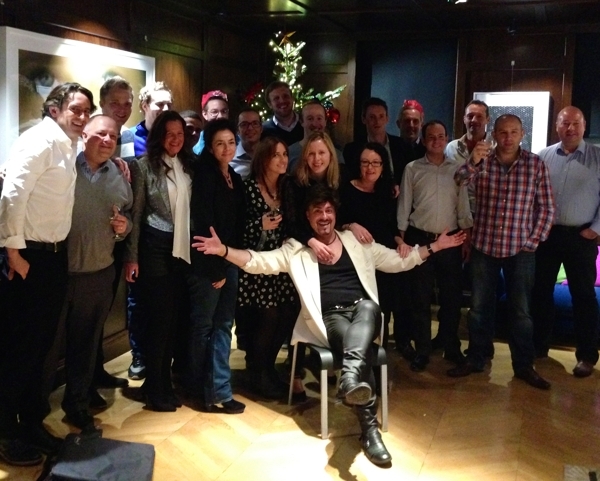 It may have been postponed because of the snow in December, but this leading South Wales Vauxhall dealer's Christmas party still had plenty of bang this month. 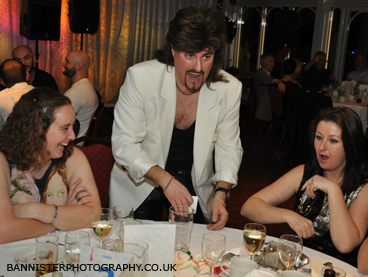 Entertaining at the huge showroom with his amazing close-up magic and following it with a forty five minute cabaret, Monrokvia's greatest magician, Kockov, had all the staff laughing right up till his classic Real Live Russian Roulette finale. 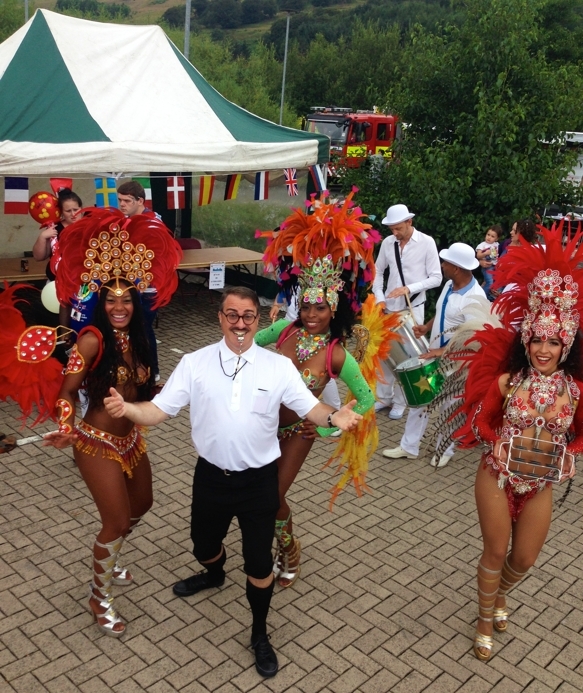 Vauxhall Director, Steve Hutchings, was thrilled, remarking afterwards "that was simply incredible". With a hog roast, plenty of drink, roulette and blackjack tables, it was another fantastic evening of fun with some truly lovely people. 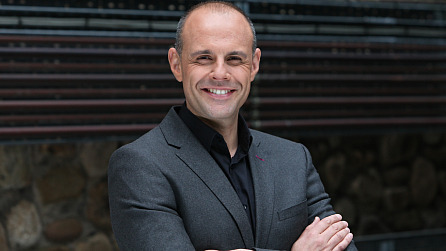 Having worked with BBC TV presenter, Jason Mohammad, several times in the past, this month Jasper was finally able to take up Jason's request to appear on his Radio Wales show. Making up the 'news pundit' panel alongside Jasper were MP Kim Howells and author Josie Henley-Einion. The Friday lunchtime look back at the week's news stories led to an amusing and lively debate, touching on banker's bonuses, Charlotte Church's comments about the Queen and the Royal Wedding. 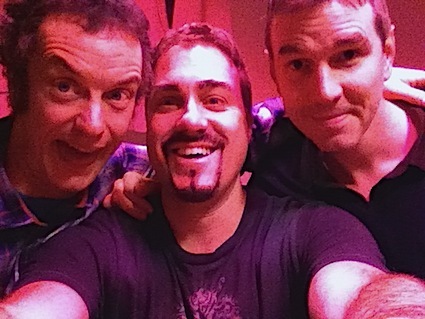 Jason and the producers were delighted by the light-hearted and upbeat atmosphere created in the studio and have already asked Jasper to appear again in the future. Kockov was shocked and delighted to find himself starring in 'The Great Voltini & Nurse Electra's Electrocution Show'. The Monrokvian daredevil was hired to perform his signature 'Real Live Russian Roulette' as part of the ex-Circus Of Horror's double act at a Victorian-themed party for 300 at an officer's mess at an army base in London. The client was totally thrilled by the whole show and the two acts worked incredibly well together. To find out more about an act that sees swallowing 10,000 volt live neon tubes and having 500,000 volts of electricity shot up a person's nether regions, visit www.voltini.com . In early December, Jasper had the pleasure of being invited to perform in a musical play at Chapter, Cardiff's leading arts venue. 'Dr. Freud's Cabaret' is a mix of theatre, music and illusion, featuring songs written and performed by respected regional artists Charlotte Greig and Anthony Reynolds. Having turned Sigmund Freud's most interesting cases into songs, director/performer Gerald Tyler, acted as master of ceremonies, whilst Jasper wove several psychologically based illusions into the action. Jasper comments "it was great fun being able to do something a bit more serious, also being employed as an 'actor' again with 'specific skills' and working with such talented people, was brilliant" Independent theatre critic, Anthony Brockway, commented "Both musically and cerebrally satisfying, Dr Freud’s Cabaret, proved to be an enthralling and memorable theatrical experience." 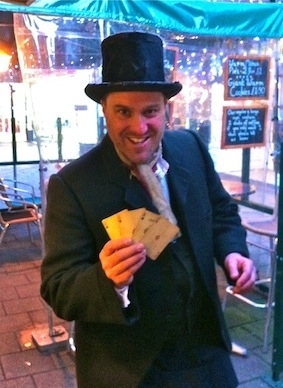 Cheeky street magician and general scoundrel, Archie Grott, was out and about spreading Christmas cheer in Abergavenny this month. 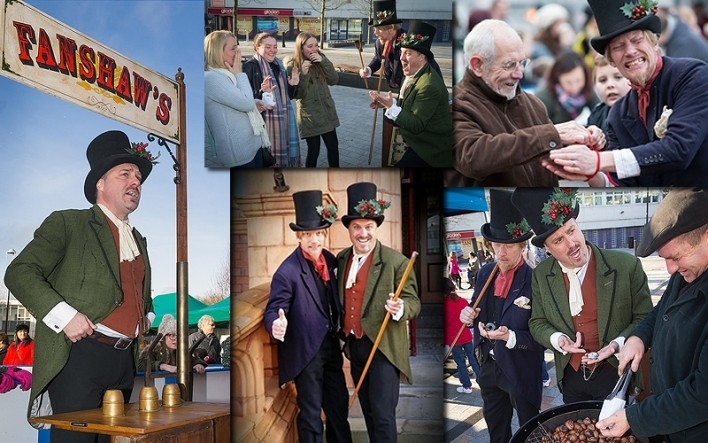 Jasper's Victorian loveable rogue got loads of interest on a bitter winters day in the town and made crowds of locals laugh and gasp in equal festive measure and everyone even left with their wallets and watches intact! Jasper was joined in November by fellow performer, Russell Wells, at Merthyr Tidfyl Christmas Lights switch on. 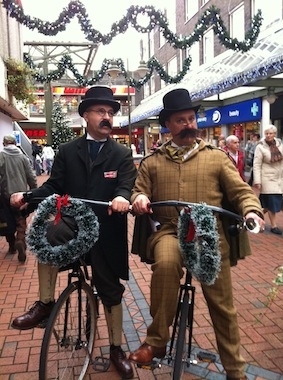 Working as Victorian mini penny-farthing riding gents, Phileas (Jasper) & Francis (Russell), the locals enjoyed their lively banter and they kept the crowds laughing as top designer Julien Macdonald flicked the switch. Jasper joined fellow performer, Frank Haschka, at Cowbridge Fashion Week in late October. As the glitzy procession made its way down the high street, Jasper and Frank wove in and out of the crowds posing as fake paparazzi. With Fleet Street-style banter and endless people posing for 'glamour' shots, the organisers were thrilled with the impact they both made. 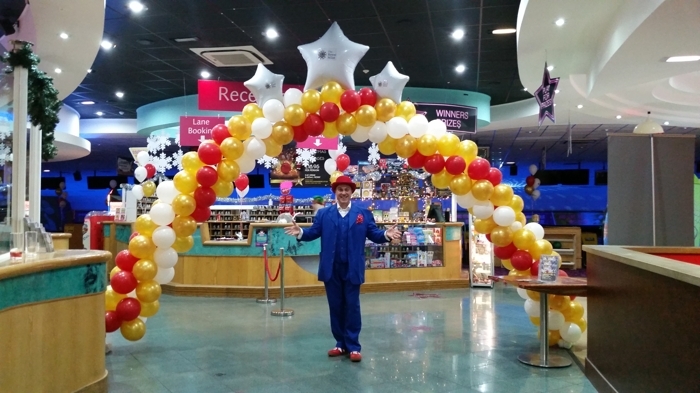 Thanks must go to Russell Wells at Pick 'N Mix for the booking. 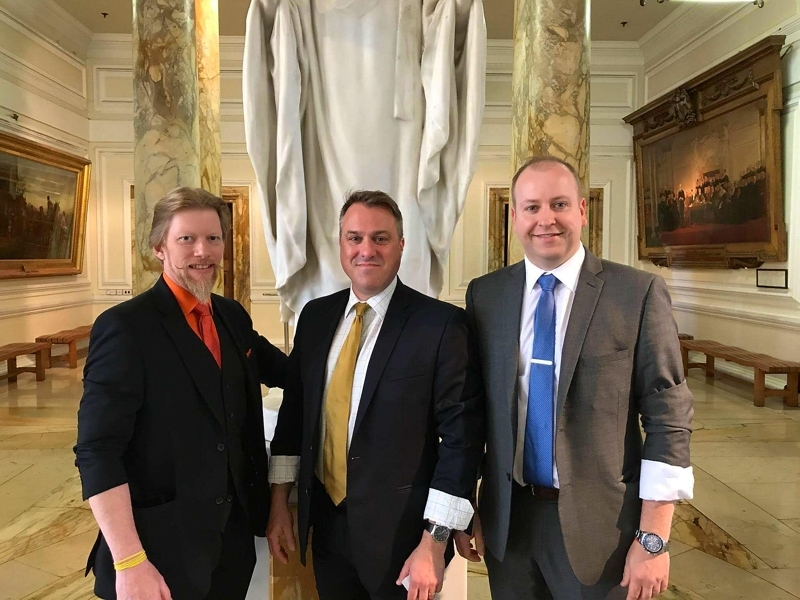 As a long-time entertainer for the charity Kidney Wales, Jasper was delighted to be invited to perform at a private function earlier this month at Cardiff's City Hall. The event was attended by Welsh opera star Katherine Jenkins and was to celebrate the opening of the newly refurbished children's Kidney unit at the University Hospital of Wales. "it was great to see several familiar children and parents at the event" comments Jasper "and being introduced by Katherine was the icing on the cake". Jasper has signed a unique deal with Cardiff City F.C. to provide family entertainment for their home games this season. The club are keen to attract more family goers to their stadium, and with PS3 games consoles, a soccer skills area and novelty photo tent, they felt they also wanted some live entertainment before each game. After an introduction through his good friend and magician, Phil Jay, Jasper met with the club and drew up a show format that involves magic, games, competitions and of course laughter. 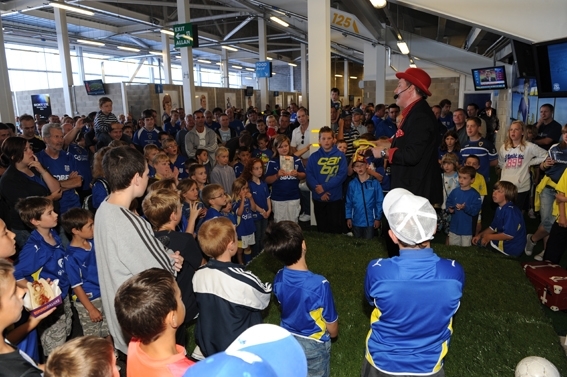 Performing a 30 minute show for small children through to teenagers right up to grandparents, takes a diverse amount of skill, but after the trial show, Cardiff City F.C. bosses were delighted they'd found the right man for the job. It's believed that this is the first time any UK football club has committed to family entertainment in this way. You can see Jasper perform in the family area one hour before kick off at every home game from 25th September onwards, but with crowds expected in excess of 300, arrive early to get a good view. Jasper was surprised to receive a text from Gary Bushell to say following the success of the performance at his wife's party, he'd put a photo of Kockov in the Daily Star Sunday. Under the column 'Hot on TV' 'Rot on TV', Gary had made another section 'Hot not on TV' and next to Kockov's photo wrote "saucy magician Kockov, right, whose amazing Russian roulette routine and uncanny ability to discern the colour of women's underwear would certainly brighten up Newsnight" Press is press, and as Tesco keeps telling me 'every little helps !'. After the recent comment about Kockov in The Daily Star Sunday, Jasper was amazed to get a call the following week from the columnist himself, Gary Bushell. It transpired that Gary was looking for entertainment for his wife's birthday party and Kockov would be the perfect surprise. So it was that around 120 family and friends , including fellow columnist and broadcaster, Paul Ross (pictured), had the pleasure of Monrokvia's finest magician in deepest darkest Kent. Despite a slightly nervous Gary Bushell helping out with the Real Live Russian Roulette, he was thrilled with the entertainment "You were sensational !" he remarked, Paul Ross wolf whistled throughout and commented that he thought it was "bloody incredible" - a lovely client and a great night had by all. 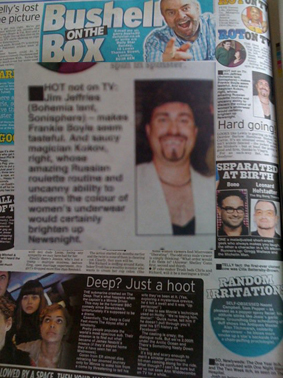 Following the recent Magicseen magazine article, it was a thrill to find 'Kockov' got a mention in The Daily Star Sunday. 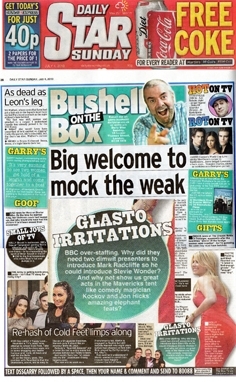 Outspoken and controversial pundit, Gary Bushell, was apparently aware of my recent Glastonbury performance - entitled "Glasto Irritations" he went on to say "BBC over-staffing. Why did they need two dimwit presenters to introduce Mark Radclffe so he could introduce Stevie Wonder? 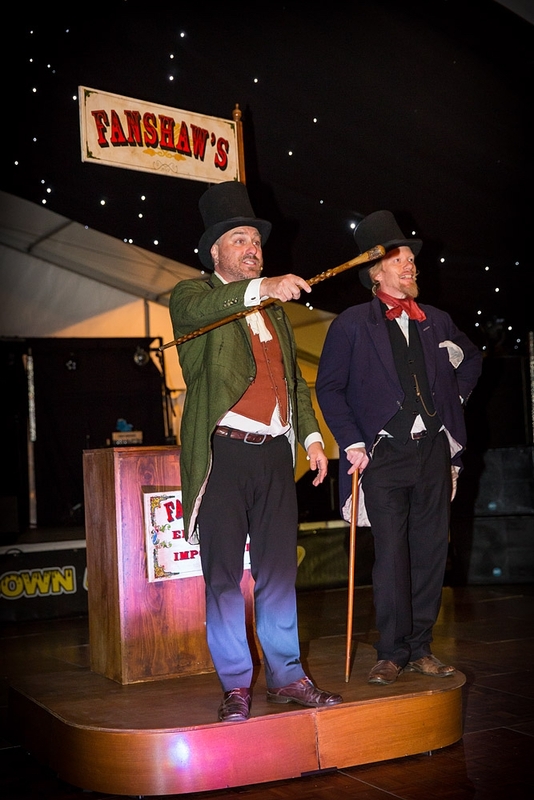 And why not show us great acts in the Mavericks tent like comedy magician Kockov and Jon Hicks' amazing elephant feats?". Maybe next time I'll make The Telegraph ! Forget about Stevie Wonder, Gorillaz and Dizee Rascal, the big draw at Glastonbury this year must have been Kockov live at The Mavericks Tent. At midnight on the Saturday, the master Monrokvian magician joined a stella line-up of Europe's greatest speciality acts and wowed the crowds with his signature Russian Roulette stunt. 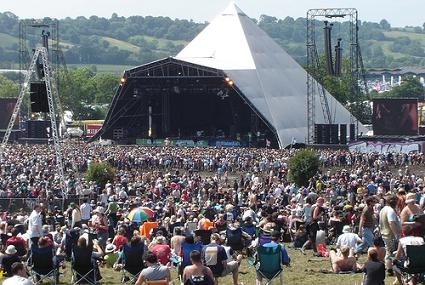 At an event where really anything goes, Glastonbury proved to be the perfect 'up for it' audience and it was a thrill to watch everyone fall silent at the climax. A real summer highlight and the promise of a return invite next year. Jasper's thrilled to have joined the elite group of magicians who've been lucky enough to grace the cover of the world's most circulated magic publication, Magicseen. The UK-based magazine has subscribers in over 30 different countries and has more readers than GQ. Jasper was delighted to be given the prestigious cover shot along with a three thousand word interview and photo shoot spread over three double pages. In the article Jasper, along with his alter ego Kockov, discusses his original approach to performance and conjuring. 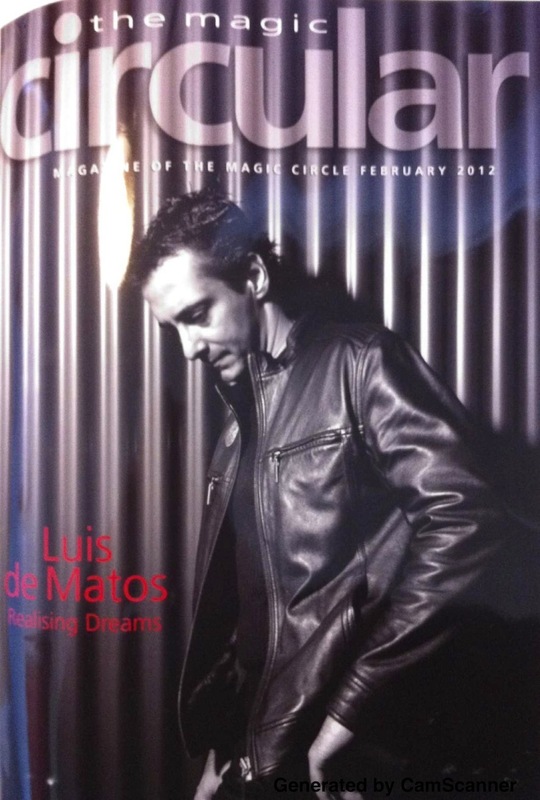 With previous Magicseen covers featuring stars such as David Copperfield, Jasper's proud to be in such illustrious company. 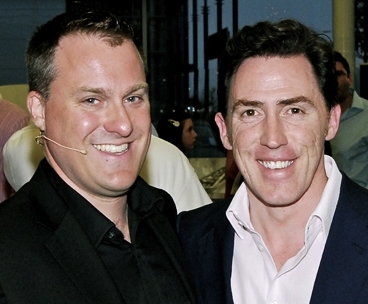 Jasper joined comedian and Gavin & Stacey star Rob Brydon again this month, for the glitzy launch of Audi's new A8 luxury car. The invited guests were treated to champagne and canapes, a string quartet, a Masterchef 'cook-off' and Jasper's trademark close-up magic. At the end of the evening, Jasper was introduced onto stage by Welsh rugby legend Ieuan Evans, to conduct the finale - 'The A8 Gamble'. Jasper had been approached by Audi earlier in the year to come up with something special for their launch, so he decided to gamble a thousand pounds cash of his own money with 4 hopeful spectators. Luckily for him, Jasper was able to keep his money, but not before giving away bottles of champagne and the finalist winning a whole weekend with a new Audi A8. Audi Marketing Manager, Jon Robbins commented, "We will most definitely be requiring your services again in the future, you were fantastic!" Jasper Blakeley occupies a unique position in the magic world. 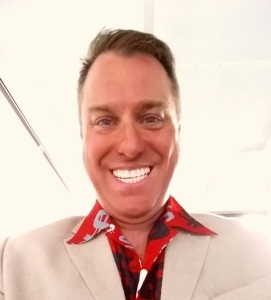 Although he does sometimes work as himself, for most stage and cabaret shows he prefers to transform into any one of about 16 different characters he has devised over the years. A professionally trained actor, he immerses himself so completely in his well-studied comic creations that the real Jasper more or less vanishes from the scene. His most popular and enduring creation to date is Kockov, a fast-talking, mullet-haired magician and mind-reader from the East European state of Monrokvia (a place found only in the atlas of Jasper’s febrile imagination). It was as Kockov that he took to the stage for his sell-out show at Cardiff’s Millennium Centre. Kockov presented eight routines in all, the majority being familiar plots (Bank Nite, Add-A-Number and so on) re-imagined for contemporary audiences, with plenty of comic and creative twists along the way. However, the slick, professional delivery of some smart mentalism routines is only part of the story. Jasper is one of the very few performers who know how to make mentalism funny, which is no mean feat. 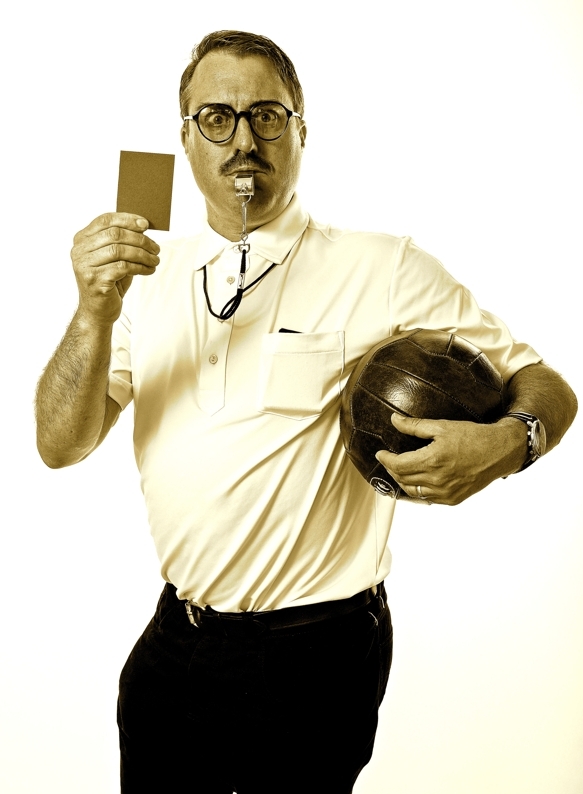 A first-rate script, packed with neat gags and asides, is part of the formula. However, the real joy of the show stems from Jasper’s rapid-fire interplay with the audience. No matter what happens or what people say, Kockov is there with an instant retort or comeback. It’s an impressive display of sharp wits and smart humour, distilled from many, many years learning his craft in front of real audiences. Jasper’s mind is like a fizzing fountain of lines, twists, gags, asides and bits of business, seemingly without end. At one point he even offered a glorious few seconds of mime – displaying a spectator’s current status on the evolutionary ladder – that brilliantly captured the comedy of the moment and won its own round of applause. The humour is sometimes a little abrasive (Kockov has not fully adapted to some of our more gentle social conventions), but never crass or offensive. The show was well produced and presented. In particular, there was excellent use of sound effects and music throughout. Jasper used to be a radio producer and audio technician, and for this show he devised something like 24 original tracks of music, effects and ambient sound, all of which greatly enhanced the performance. The presentation for his signature ‘Russian Roulette’ routine was very dramatically effective. Room for improvement? Maybe. Sometimes the ‘procedural’ aspects of the routines dragged a little and could do with a re-think, and one routine suffered from the kind of maddening technical glitch that even thorough rehearsal cannot entirely prevent. However, these are minor points that in no way detracted from the show. This was a solid performance from a unique talent, combining a high degree of professionalism with truly impressive comic flair. A very satisfied audience filed out of the WMC thoroughly baffled by the ‘mind skills’ on display, but also rather exhausted from laughing so much. Thanks to all 250 of the audience who made Kockov ! 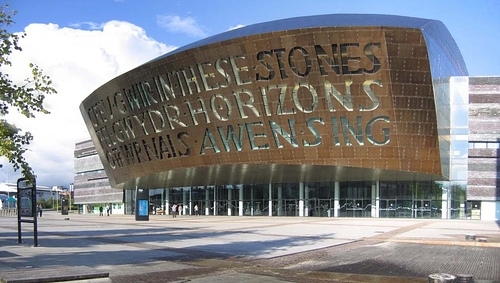 , the 90 minute one-man show at the Wales Millennium Centre in Cardiff Bay on Saturday March 6th a sell out. Featuring mental stunt world premieres, mind-reading, auto-suggestion and Real Live Russian Roulette, the crowd was really 'up for' it and the deluge of kind comments afterwards were very much appreciated. Sorry for those who ended up on the long reserve ticket list and couldn't get a seat, fear not plans are being made for the next big show. 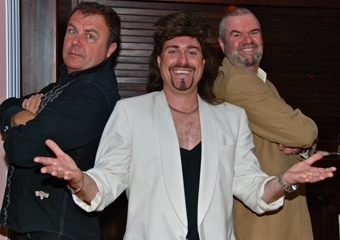 It was mullet-magic time again for Jasper in November '09, as Kockov graced the New House Country Hotel in Cardiff for a very special 60th birthday party. After warming the guests up around the tables with his unique close-up magic, Kockov provided a half hour mind-magic cabaret, complete with his Real Live Russian Roulette finale. Spanning 4 generations, the audience thoroughly enjoyed meeting Monrokvia's greatest mind-reader and magician, and you can tell from the laughter and total shock in the photo that they all had a great time. Thanks to host Clive, who remembered seeing Kockov at a dinner a couple of years ago and "simply had to have him" on his big day. It's always great when an agent offers you interesting work, and in the summer of 2009, it was a multi-millionaire's birthday party for his wife that called on Kockov. 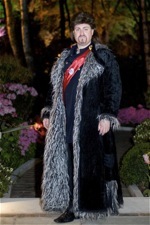 Spending close to half a million pounds for a party, but what does that buy you when the theme is 'Russian Tsars'? How about valet parking, horse-mounted soldiers, ballet dancers, Cossack dancers, opera singers, fire jugglers, acrobats, a 20 foot human snow globe, 3 bands, giant fountains made of flowers, 30 Russian dressed staff, 3 bars, 3 buffets a giant chess board dance floor and Monrokvia's greatest mind reader and magician, Kockov! 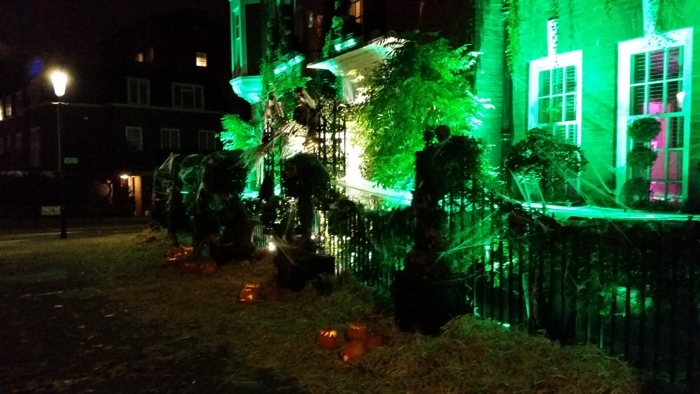 A truly amazing party all set within the grounds of a private house in London, complete with botanical gardens. Great fun all round. 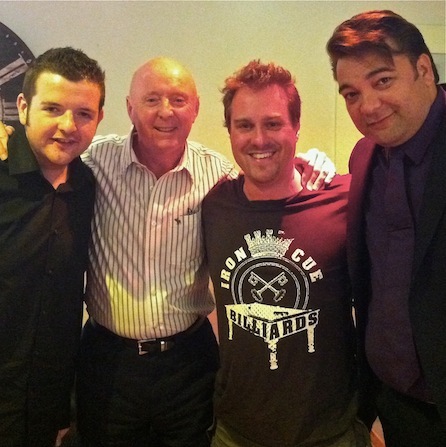 Following the release of his 2 mind reading dvds, Jasper was thrilled in January 2008 to be invited to become a member of The Magic Circle in London. This exclusive magic club only has 1500 members worldwide and only several hundred living in the UK. Jasper is proud to say he's one of only a few members to be based here in Wales. Jasper realised a lifelong ambition in September 2007, when he was invited to perform in Las Vegas by international illusionist, Russ Stevens. The three-day Toni & Guy (TIGI) product launch at The Mandalay Bay, was culminating in a 45 minute 1.5 million dollar illusion show, and Jasper's skills were needed. Even though Jasper puts guns to his head for his Real Live Russian Roulette routine, being handcuffed and locked into a glass trunk filled with several hundred gallons of water was a whole new level of fear. It was an amazing experience, and the 5,000 strong audience were amazed, plus the client was thrilled too. 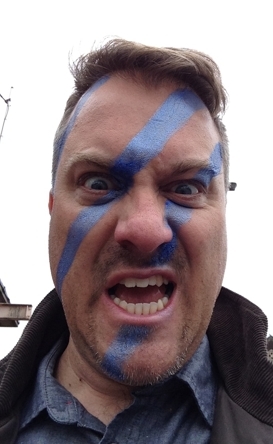 Thanks must go to Russ for getting Jasper involved with this amazing corporate event. 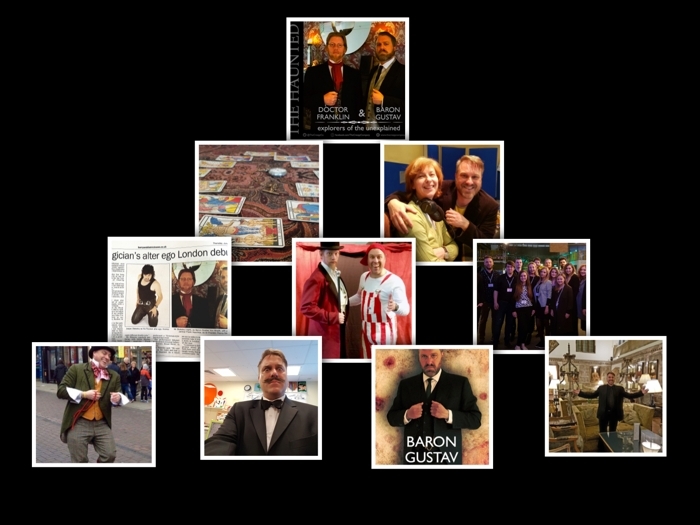 Jasper works as a close up magician, wedding magician, cabaret magician, comedian and compere all over the UK and abroad. He's been fortunate enough to have worked for Blue Chip companies, arts events and private functions throughout the British Isles, including as a close up magician London, close up magician Birmingham, close up magician Leeds, close up magician Glasgow , close up magician Sheffield, close up magician Bradford, close up magician Edinburgh, close up magician Liverpool, close up magician Manchester, close up magician Bristol, close up magician Wakefield, close up magician Cardiff, close up magician Coventry, close up magician Nottingham, close up magician Leicester, close up magician Sunderland, close up magician Belfast, close up magician Newcastle upon Tyne, close up magician Brighton, close up magician Hull, close up magician Plymouth, close up magician Wolverhampton, close up magician Derby, close up magician Swansea, close up magician Southampton, close up magician Salford, close up magician Aberdeen, close up magician Westminster, close up magician Portsmouth, close up magician York, close up magician Peterborough, close up magician Dundee, close up magician Lancaster, close up magician Oxford, close up magician Newport, close up magician Preston, close up magician Norwich, close up magician Chester, close up magician Cambridge, close up magician Salisbury, close up magician Exeter, close up magician Gloucester, close up magician Lisburn, close up magician Chichester, close up magician Winchester, close up magician Carlisle, close up magician Worcester, close up magician Bath, close up magician Durham, close up magician Lincoln, close up magician Hereford, close up magician Inverness, close up magician Stirling , close up magician Canterbury, close up magician Lichfield, close up magician Ripon, close up magician Bangor, close up magician Truro, close up magician Ely, close up magician Wells and close up magician St Davids.